Yes, it’s been quite a while since the last update, but I have been busy! 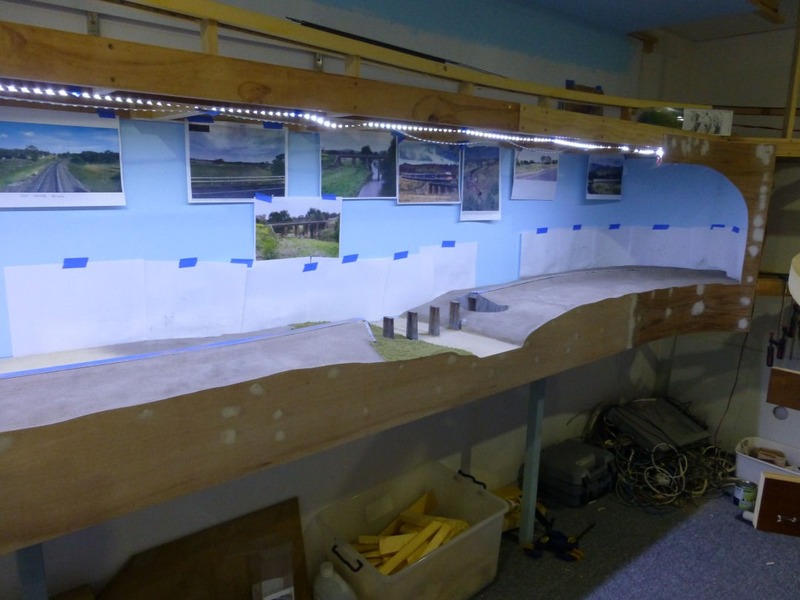 I have pretty much concentrated on scenery work from Chilcott’s Ck through to Kankool, including shaping of scenery foam, applying scenery materials around the bridge and installing the front fascia board. 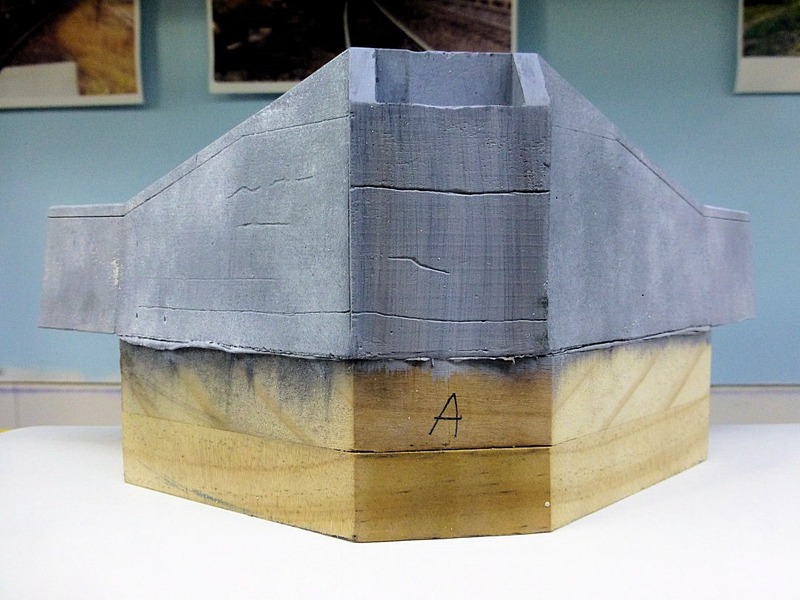 The pictures below show the results of foam carving and application of scenery ‘mud’. Between this point in time and the next set of photos, the fascia was attached from the bridge towards Kankool. 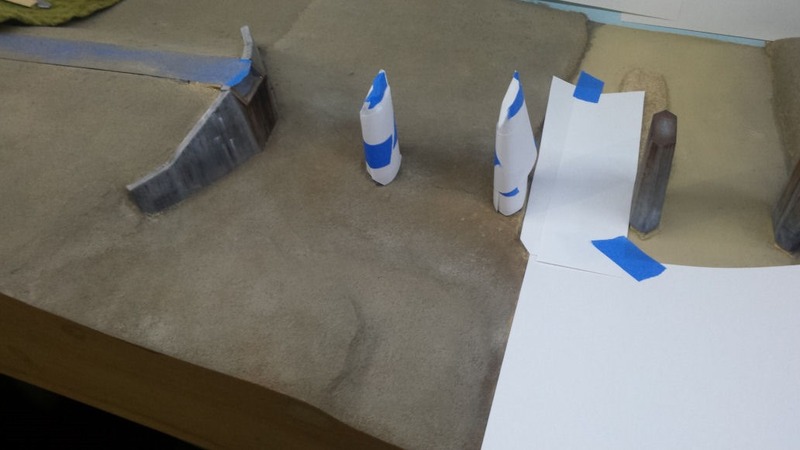 I prefer to carve the scenery foam to shape prior to fixing the fascia in place. 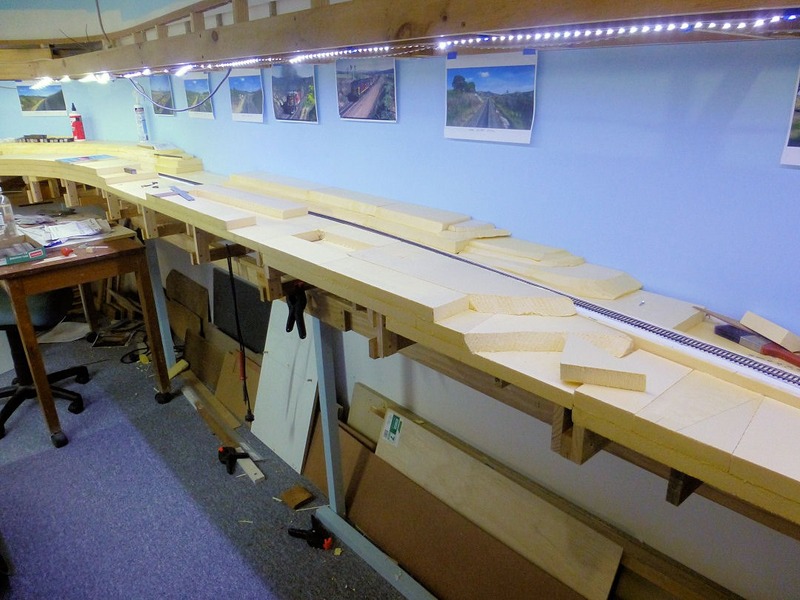 Once I have the final contours shaped, some 3mm ply is cut to the required width to suit the highest point. I have allowed around 80mm ‘drop’ below the bottom edge of the benchwork. This will allow the fitting of curtains at a later date. 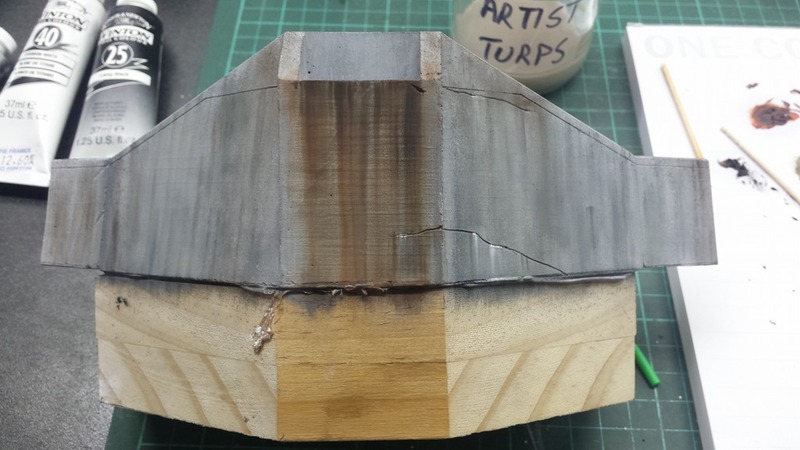 The piece of ply is held or clamped in position against the foam and a line traced against the scenery contour on the inside of the ply. The ply is then removed and cut to shape with a jigsaw. 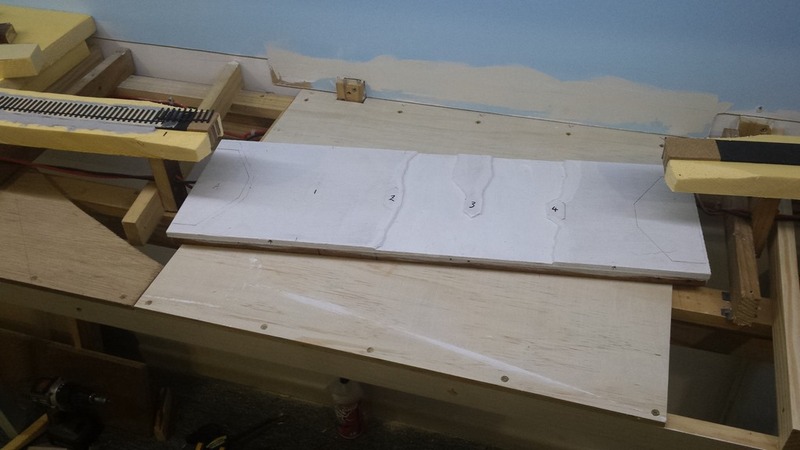 The shaped ply is then glued and screwed to the layout. Next came the task of fixing the bridge piers in place. The process was rather simple after much thought!! The bridge itself was placed in position on the abutments and held down with weights. Then each pier was checked for height to the underneath of the girders. Where required, some extra packing was glued down first. A gap of around 2mm was left between the top of the pier and the girder. Then the bridge was removed, a bed of Liquid Nails applied where the pier was to sit, then the pier was lightly pressed into the glue. The bridge was then placed back in position and weighted down again, pushing the pier into the glue. 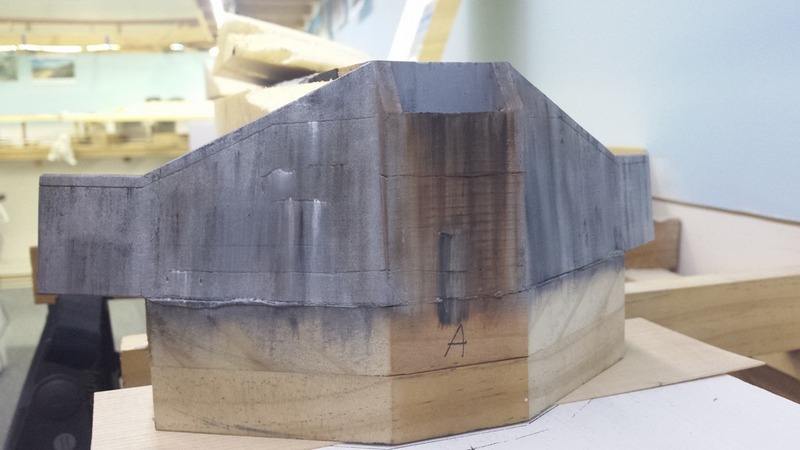 To make sure the pier did not sink into the glue while it was curing, small pieces of wood were chocked under it to make sure it touched the underneath of the girder. Each pier was left for at least 24 hours to allow the glue to set. The above sequence was repeated for the remaining piers. As can be seen in the first photo above, I had to cut out a small section of the scenery between the first and second piers to allow access to the first pier, as it is partly buried in the ground. 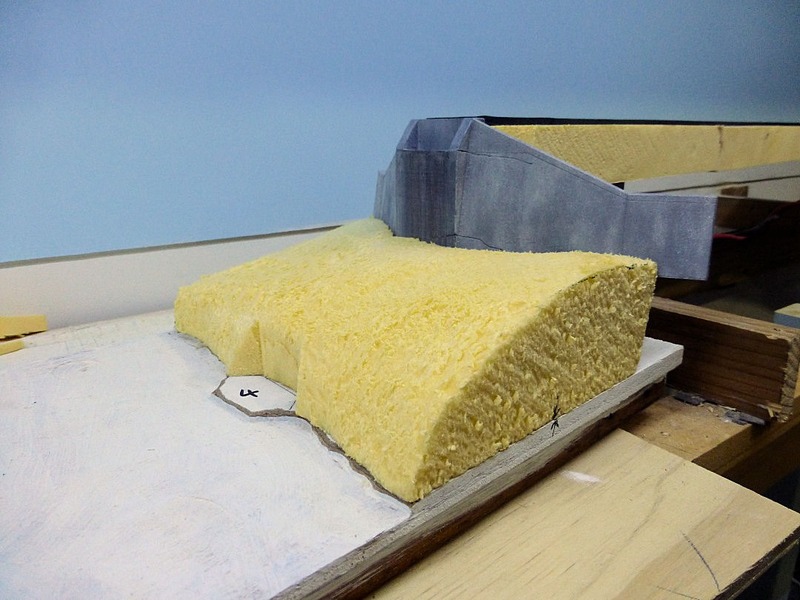 The small piece of foam has now been re-glued in position. The pictures above show all piers in position and the bridge temporarily in place for checks. 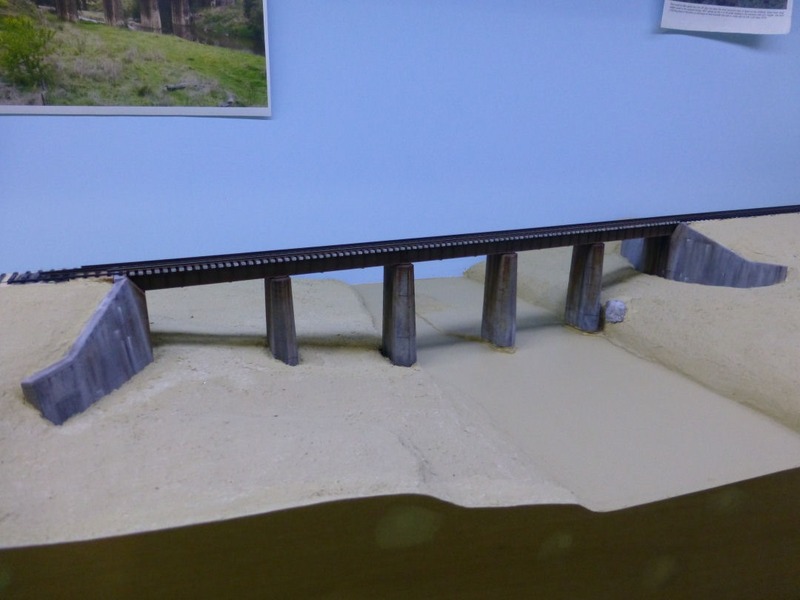 The next task was to apply a base cover of scenery dirt around the bridge area. Coloured grout was used and sifted onto the foam using a small container with an old stocking stretched across the opening. A 3:1 mix of water and matte Mod Podge was brushed onto the foam, the grout applied and then fixed in position with the same glue mix applied using a fine mist spray bottle. Then came the beginning of the fun stuff – applying grass! 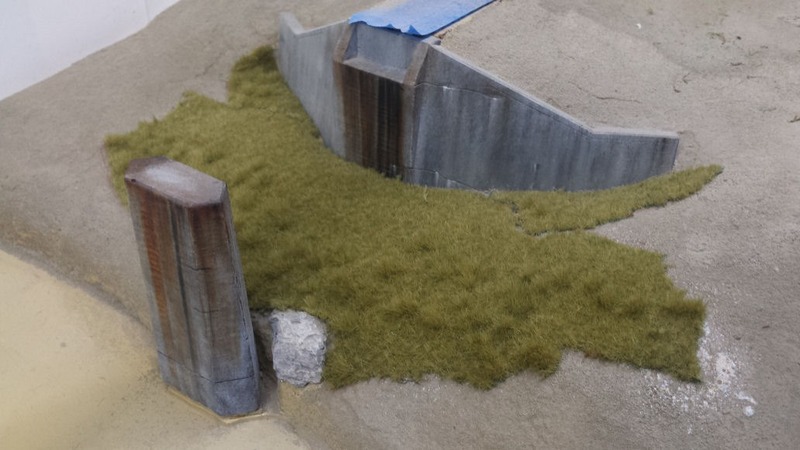 I found some grass mat by Silflor and decided to use this around the bridge because it was going to be difficult to get the static grass applicator in close enough to the bridge piers. 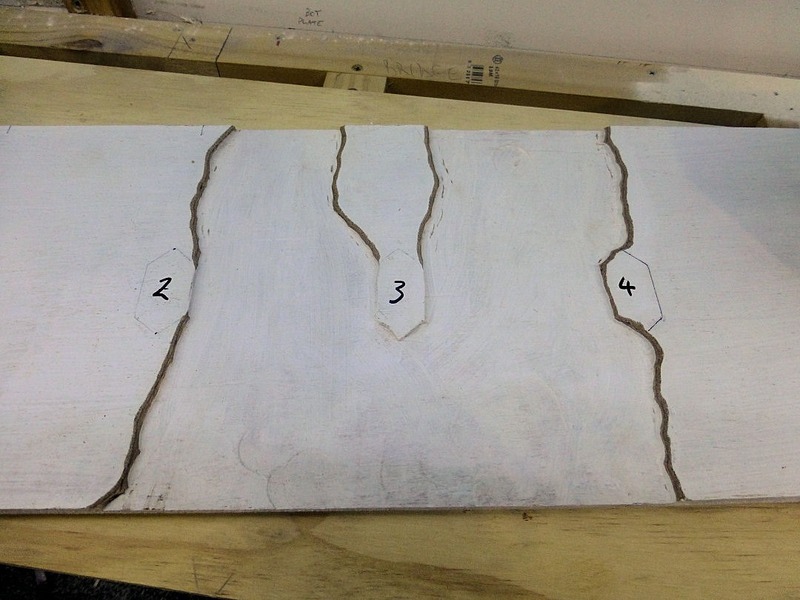 The first piece was cut roughly to shape and placed in position for checking. I made sure the edges were ‘torn’ rather than cut with scissors to avoid a sharp edge. 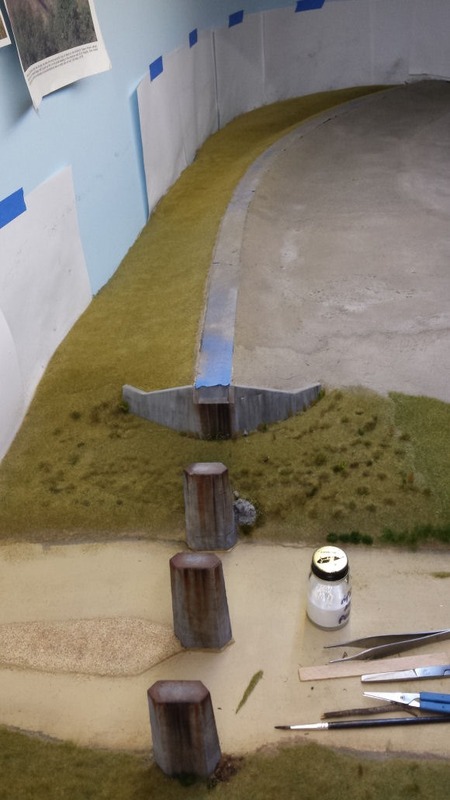 The area was then masked off and a spray adhesive applied to the foam as well as the back of the grass mat. This was allowed to go ‘off’ to the point it was tacky and then the mat pressed into position. The above picture shows grass mat fixed in position. The edges and joins will be hidden by more grass later. 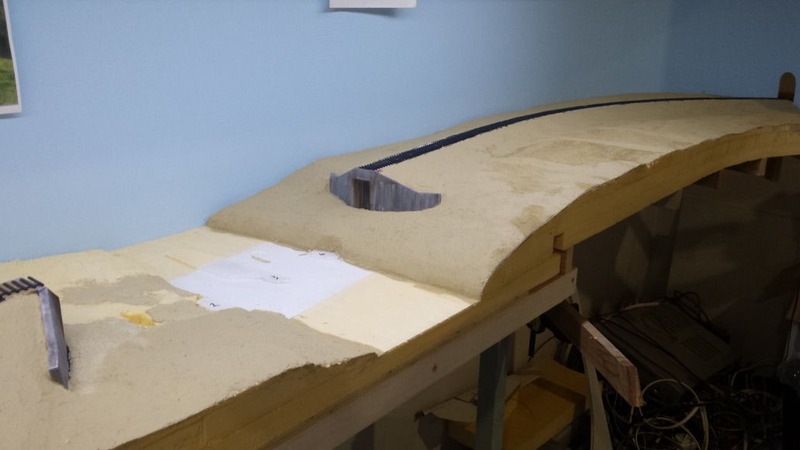 Before I could finish applying the scenery dirt around the entrance to the layout from staging, I had to install the end section of fascia and valance. This proved quite tricky as it was a compound curve. 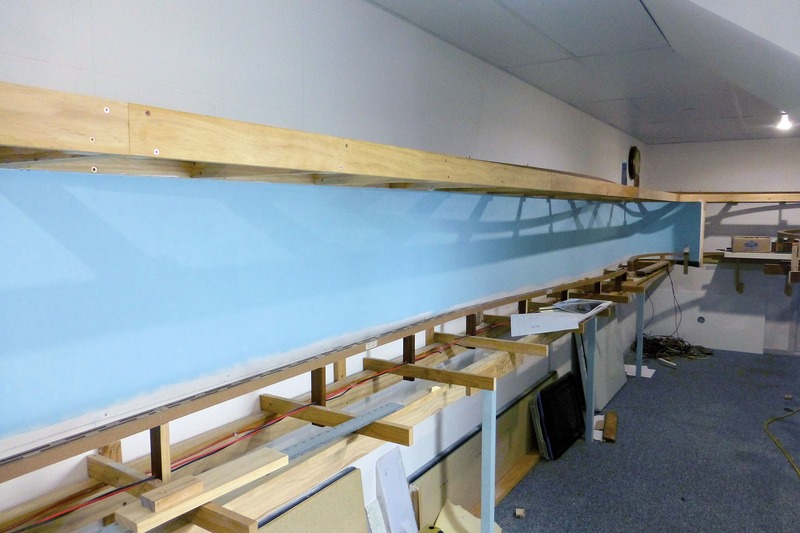 The pictures below show it fixed in position and some shots of the rest of the fascia towards Kankool. 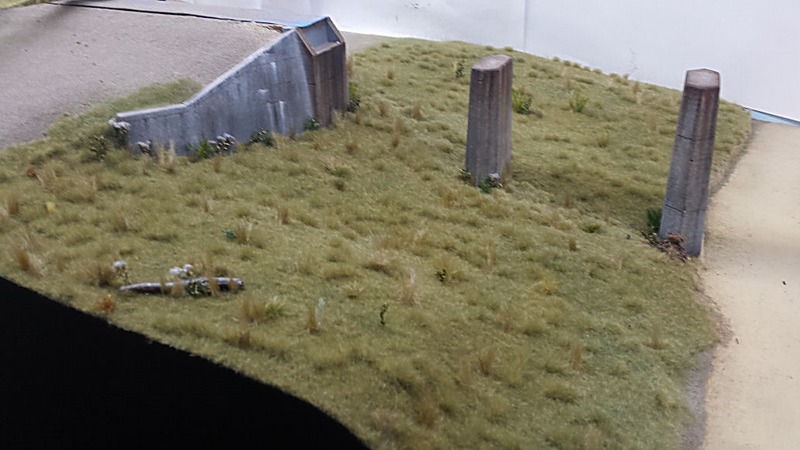 Next came the job of detailing the grass mat around the bridge. Various products from Silflor, Mininatur, Woodland Scenics etc were used. Fake fur was also used for grass tufts. It certainly takes away the ‘blandness’ of the original grass mat. 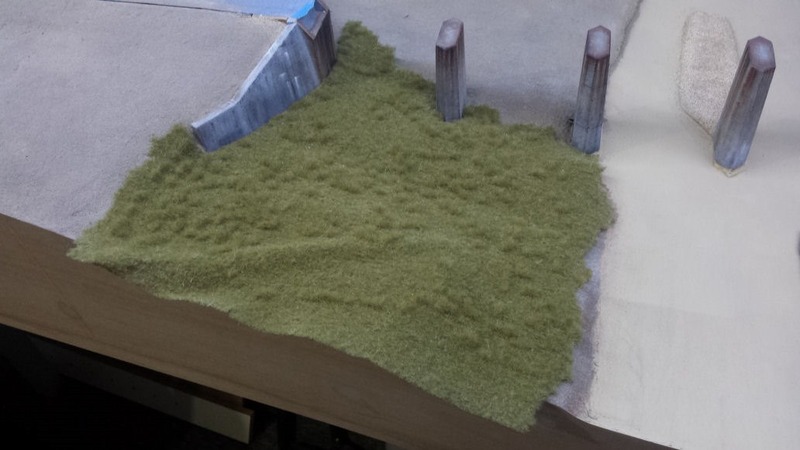 The remaining scraps of grass mat were also glued down on the other side of the bridge with the remaining area covered by 2mm static grass in a matching colour. 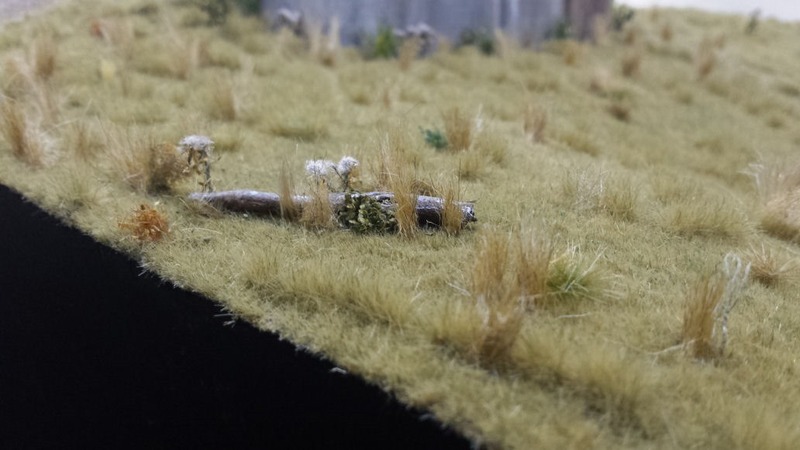 A base cover of 2mm static grass was also added to larger areas. This will be later detailed with tall grass. 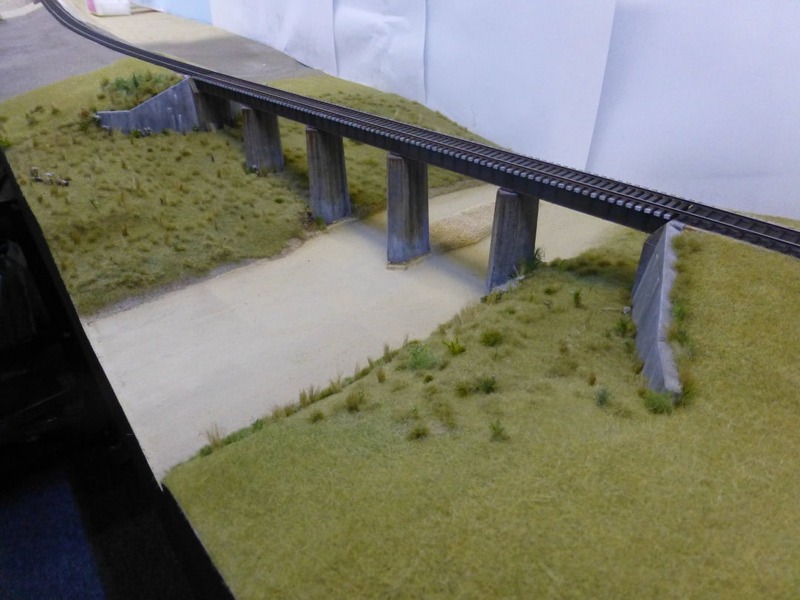 With the majority of grass work now complete around the bridge, I could now finish of the tracklaying either side of the bridge. 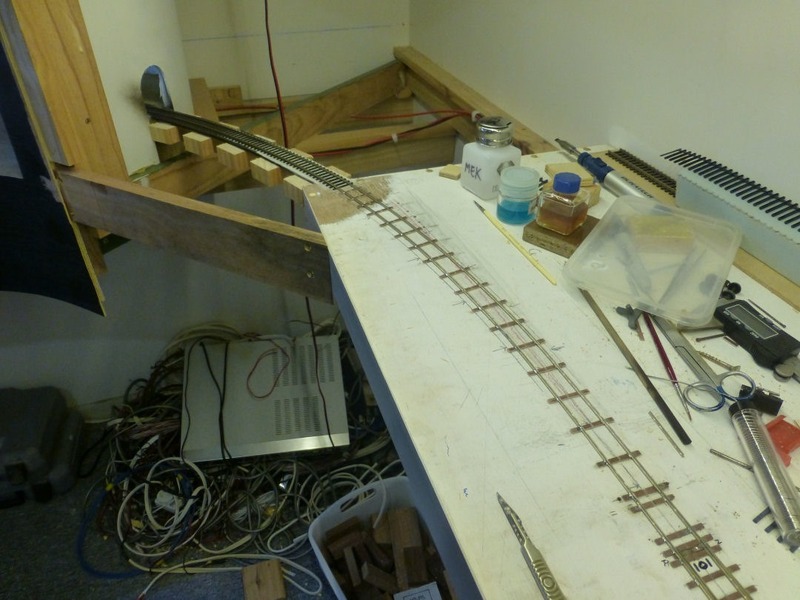 I had previously left over length pieces of rail attached to the bridge to transition to the remaining track. It was just a matter of again sitting the bridge temporarily in position and laying more rail to meet up with the bridge rails. More fishplates were also added to this section. I also completed the missing track link between the bridge and the Up staging yards. 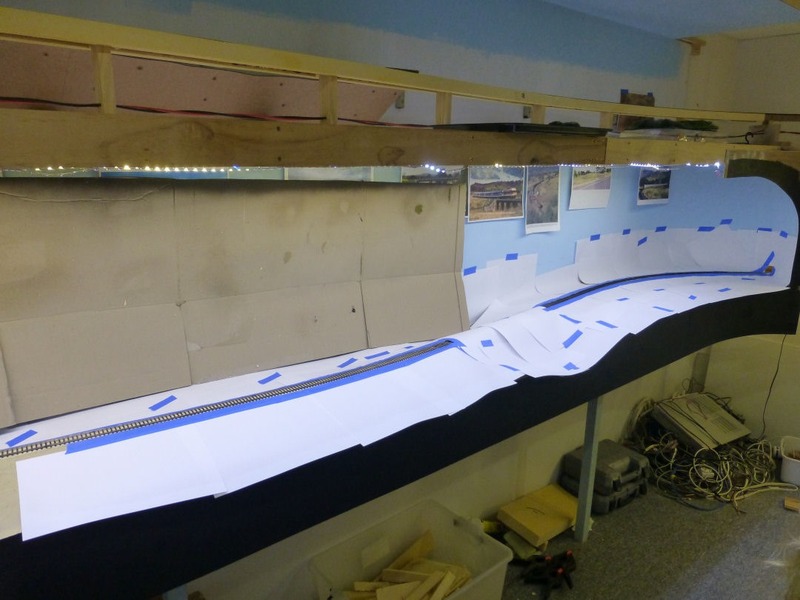 Now that the track was pretty well complete from the staging through to Kankool, I decided to give it a coat of Krylon Camo brown. The surrounding areas were masked off and the track was sprayed. A couple of shots of the bridge scene. The bridge is still just temporarily in position at the moment, as I want to pour the ‘water’ in the creek before permanently fixing it down. 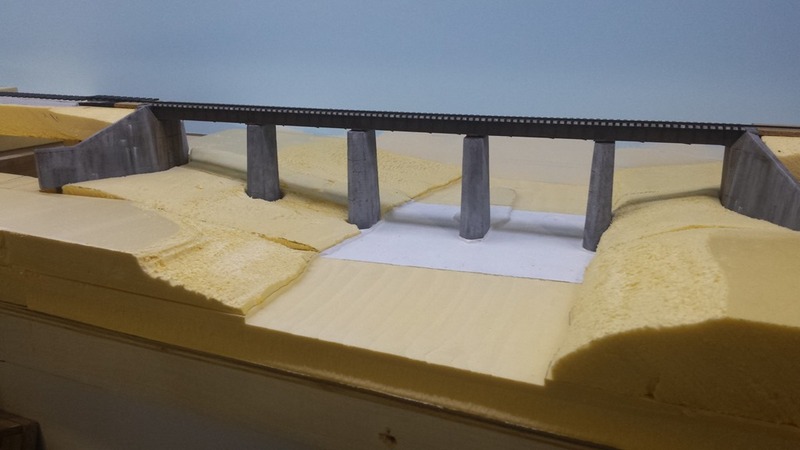 There is still quite a bit more detailing to go, but this can be done once the bridge is fixed in position. 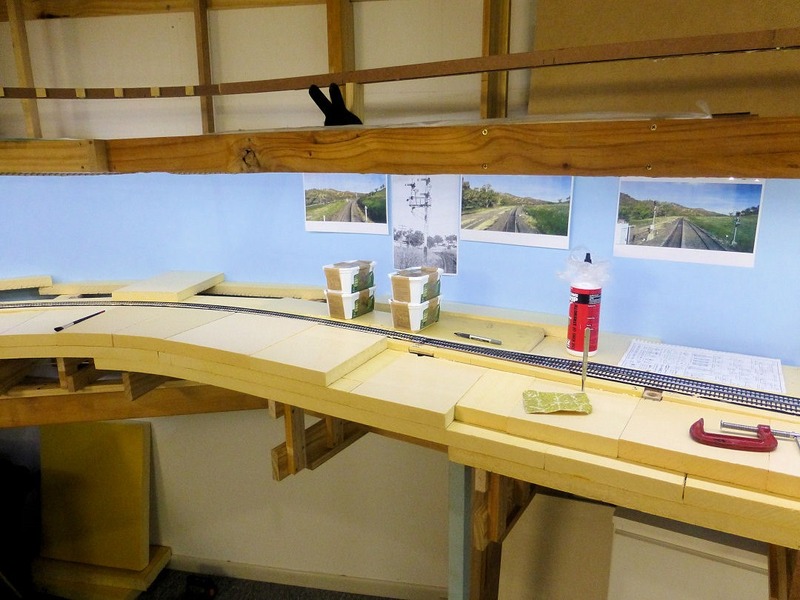 Now that the track was complete from staging onto the layout, I added some fall protection to the short section there. Well, that’s pretty much where the layout is up to at the moment. 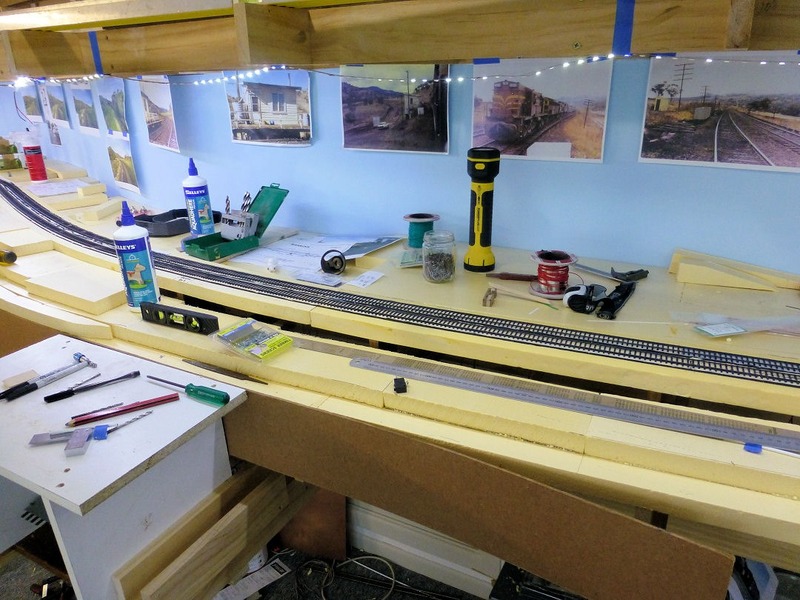 This will be the last post on the blog as I have decided to create a Facebook page to continue to show progress on the layout. Please check it out. The blog will remain as an archive. All the best to all my followers for Christmas and the New Year. Since the last post, I have continued with the laying of rail from Kankool towards the bridge at Chilcott’s Creek and also for a couple of metres towards Ardglen. 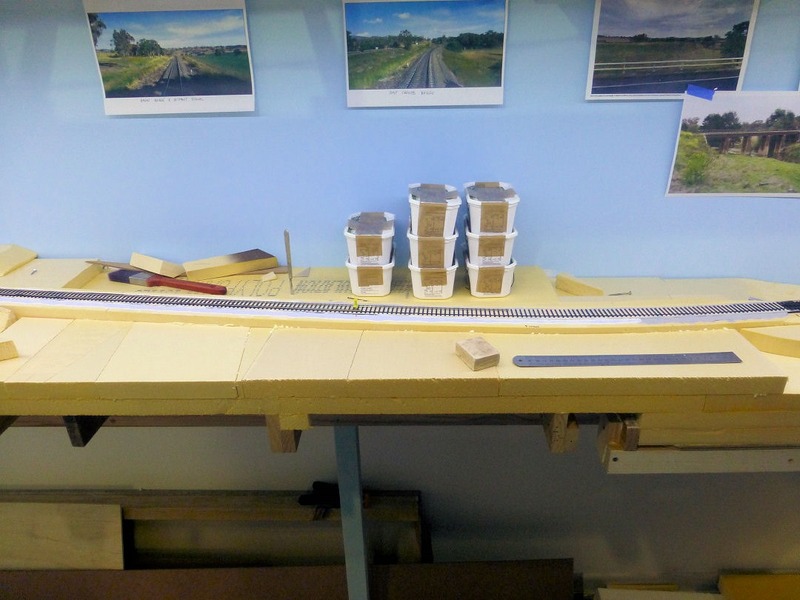 This had come to a bit of a standstill due to me running out of the 3D printed fishplates a couple of months ago, but I have since come up with a new plan to allow tracklaying to progress independent of my stocks of fishplates. 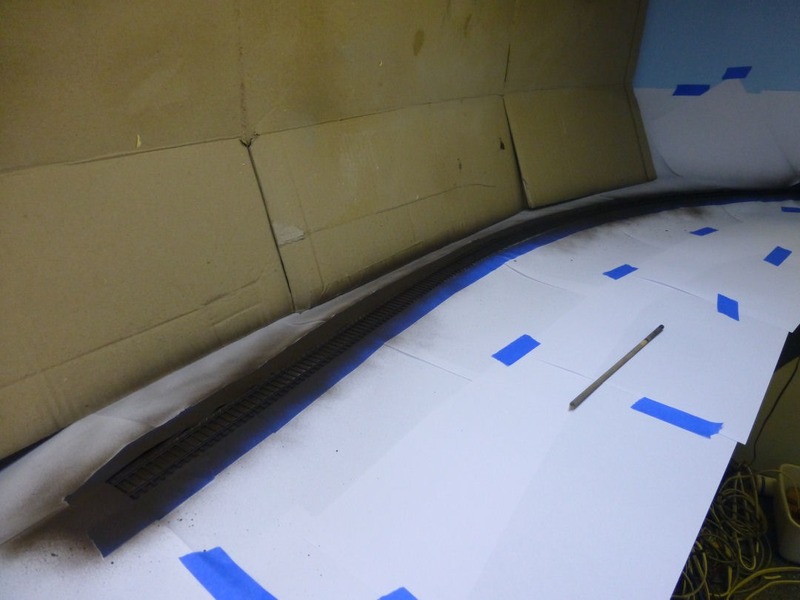 I have started to paint the non-viewable side of each rail with the Krylon camo brown prior to fixing to the CV ties. There is no need to have fishplates on the non-visible side of the rail. That being said, I did fix them to both sides of the rail on the main and loop roads at Kankool, but only realised it was a waste after the fact! 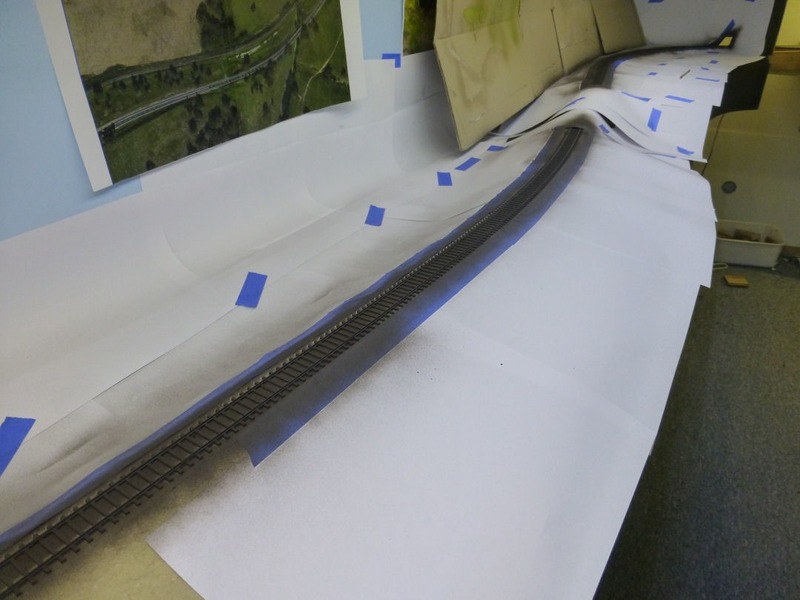 Once the half-painted rail is fixed down, I will then go along and glue the fishplates to the viewable side of the rail and then spray the whole track, including the CV ties, with the Krylon. I think this will aid in colouring and weathering the CV ties later on. 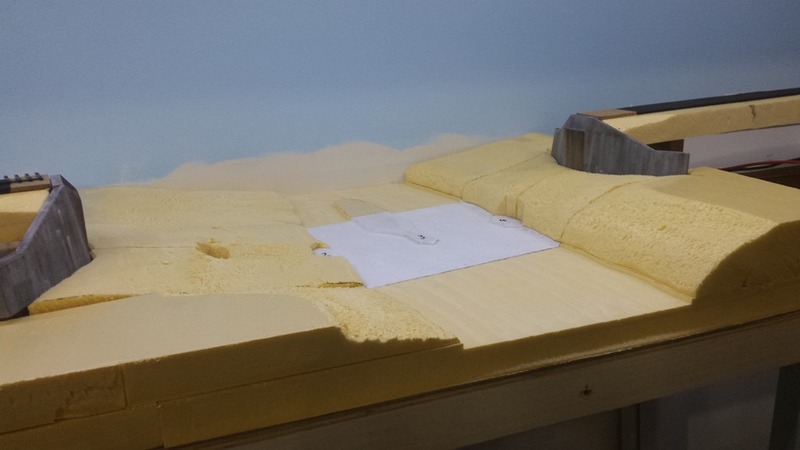 Over the last few months, in between other jobs, I started to glue down copious amounts of the XPS yellow foam in readiness to begin shaping the landform in the section from Chilcott’s Creek and through Kankool. 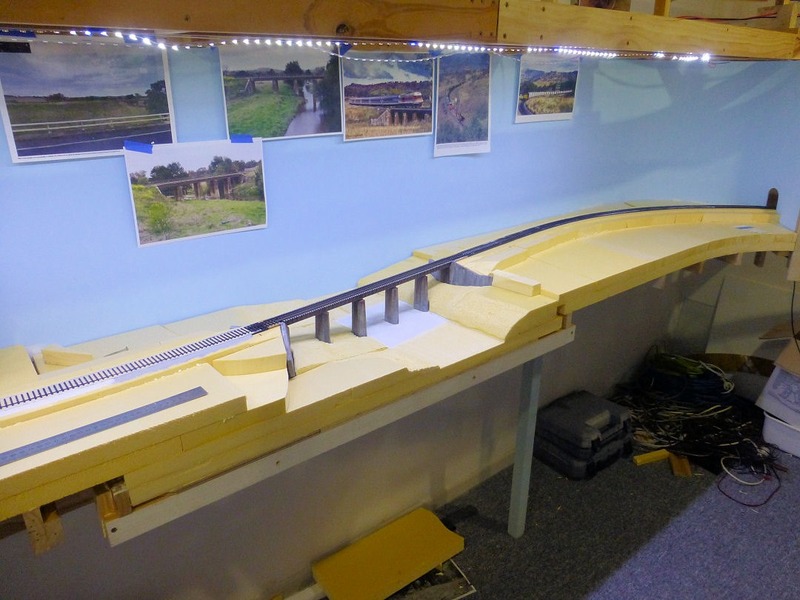 A brief update on some more progress on the Chilcott’s Creek bridge scene. 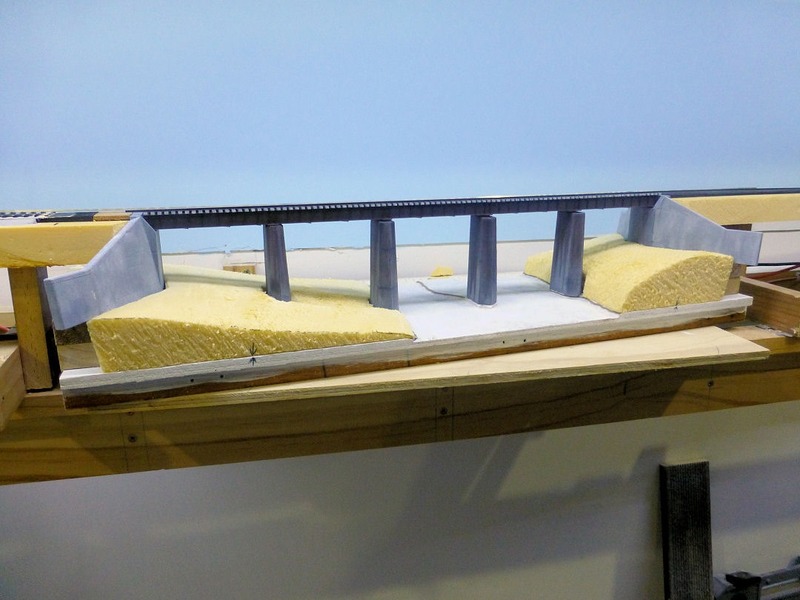 The bridge abutments are now fixed in position, and most of the foam is also fixed down. 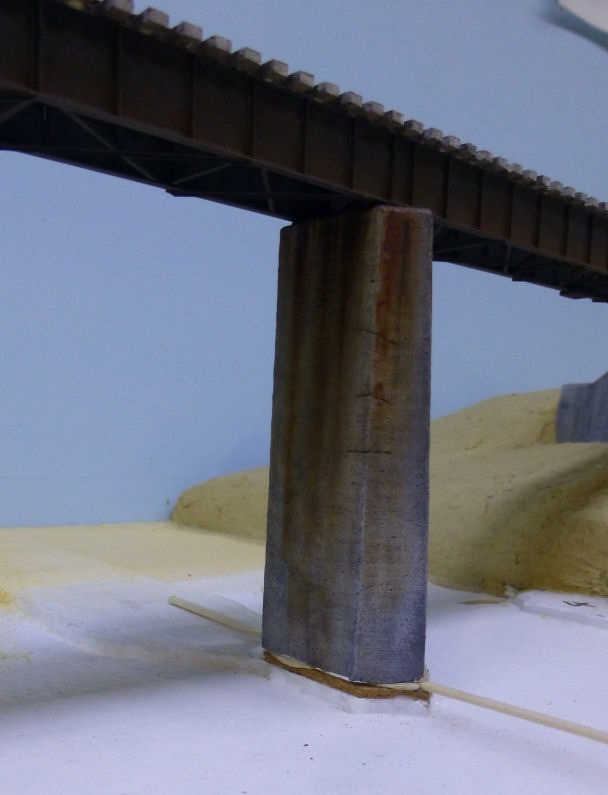 I also did some more weathering to the bridge piers. Following on from the previous Part V post, the rust streaking was done using oil paints and turps to drag the colours down the piers. I’m quite happy with the results with some more work to be done. 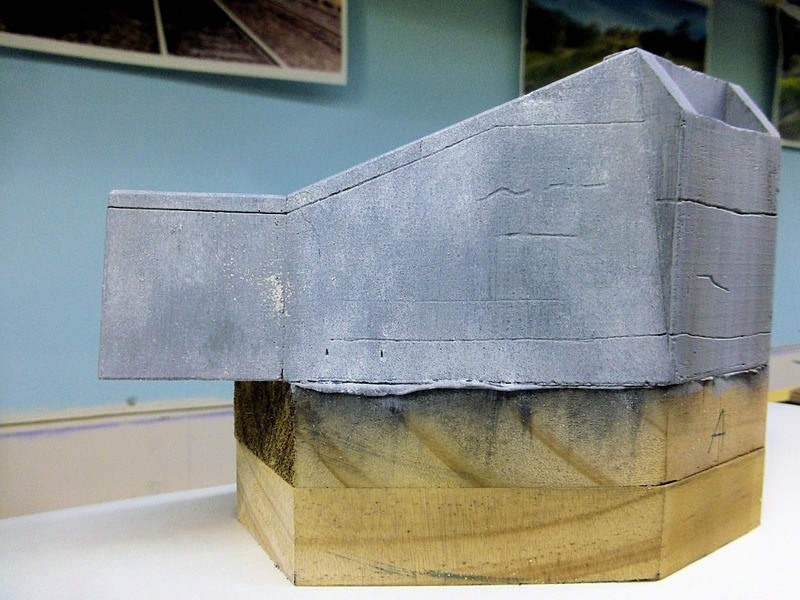 I have recently been redoing the weathering on the Chilcott’s Ck bridge abutments and piers. I wasn’t happy with my first attempt using the acrylic crayon powders quite a while ago. So, this time using oil paints, I applied an all over light grey colour using a stippling brush and I think it has produced a neat effect. Then using other colours like black, white and more grey, I have again stippled over the top for a random effect. For the rust staining, I used the oils again but washed them down with turps. Again pretty happy with the results so far. 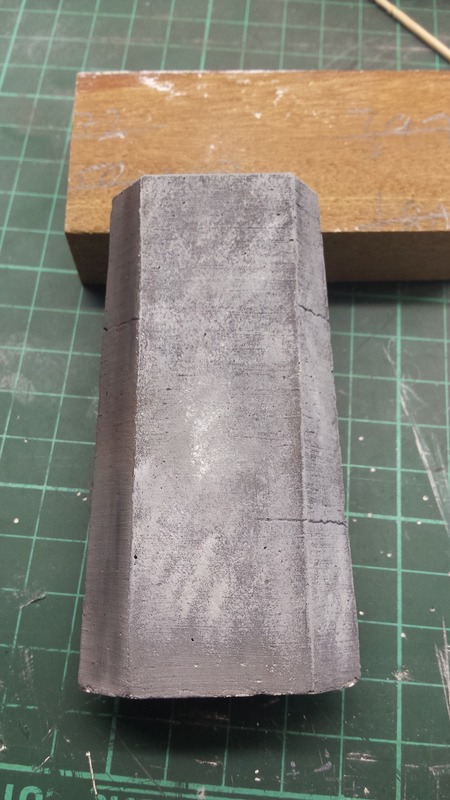 I have also finished the “base” grey coat on the piers and will let that dry before moving onto the rust staining. 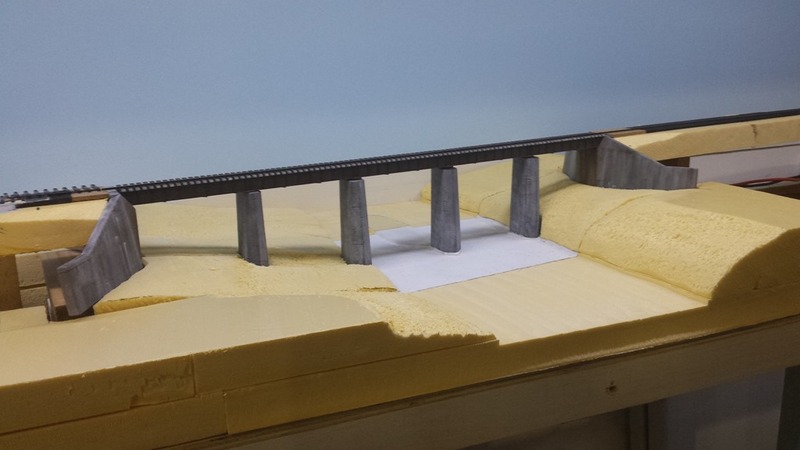 I have also made some more progress on the Chilcott’s Ck bridge scene over the last few days. A slight change of plans to what I mentioned previously, in that I have decided to fix the timber sub-module base in place then add the scenery foam around and on top of it. The abutments will then be fixed in place, along with the piers. 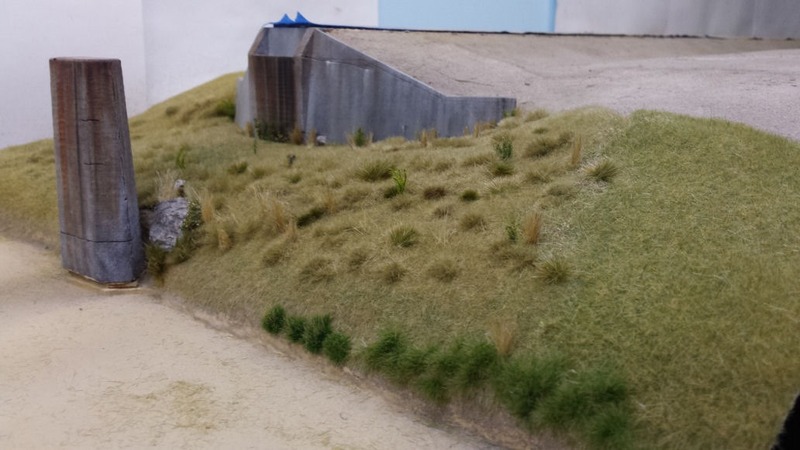 Scenery including dirts and grasses will then be applied, and hopefully some ‘water’ in the creek! The bridge span will then be fixed in place once all this has been completed. Pictures show all the foam pieces and the sub-module base temporarily in place. 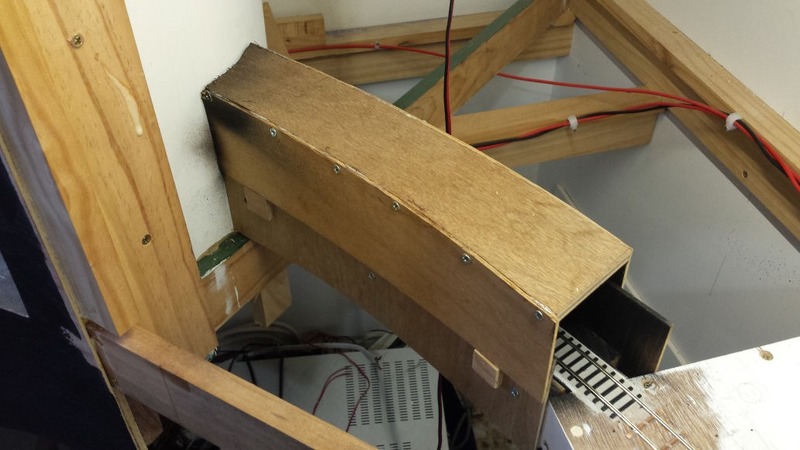 A plywood base was fixed in place to provide support for the foam. 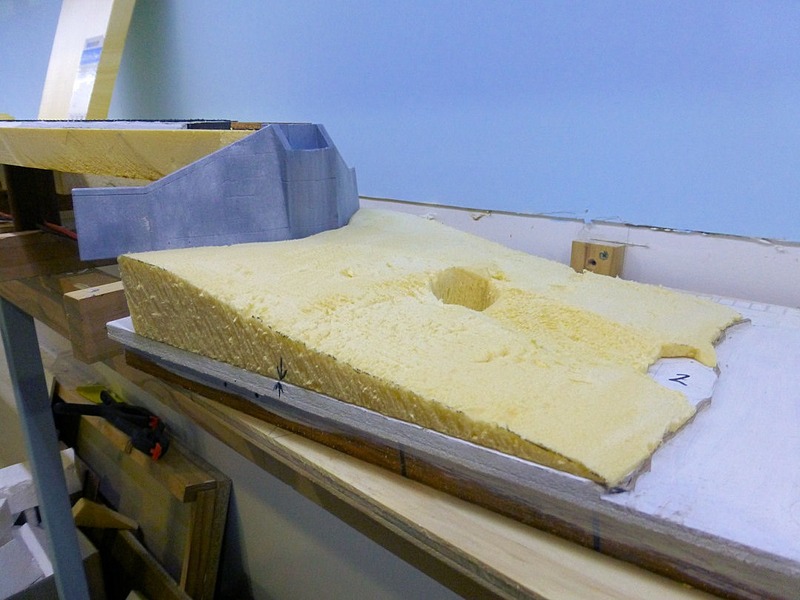 With the bridge sub-module sitting in place, a jigsaw of various pieces of foam were cut to fit. 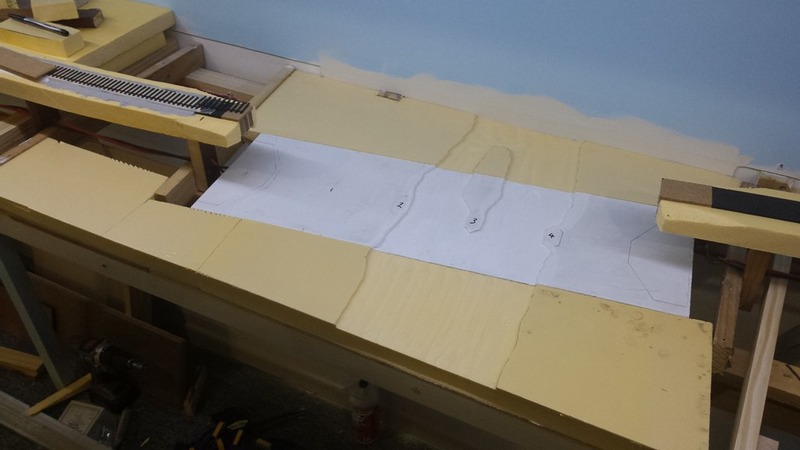 First off were two pieces front and back to continue the creek bed, which was drawn in and then routed out to the same depth as on the timber sub-module. 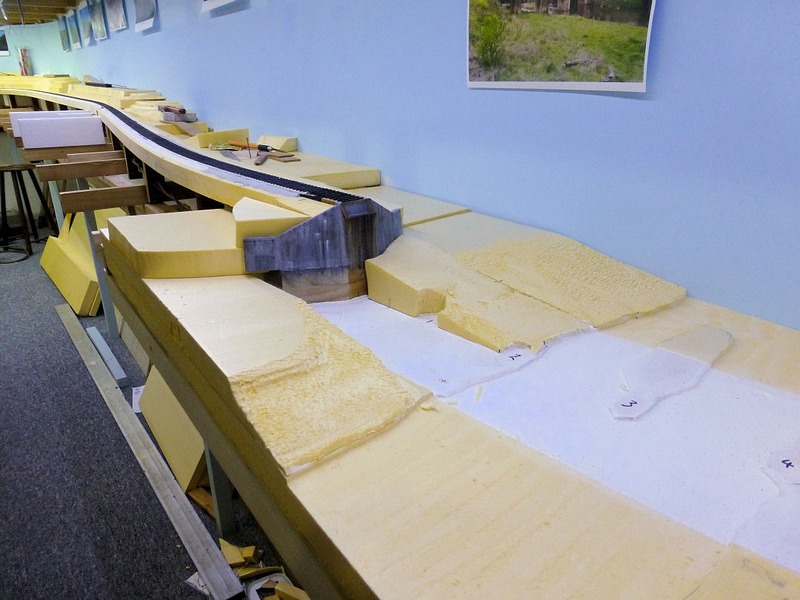 Then other pieces of foam were cut and shaped to fit the previously made pieces under the bridge. 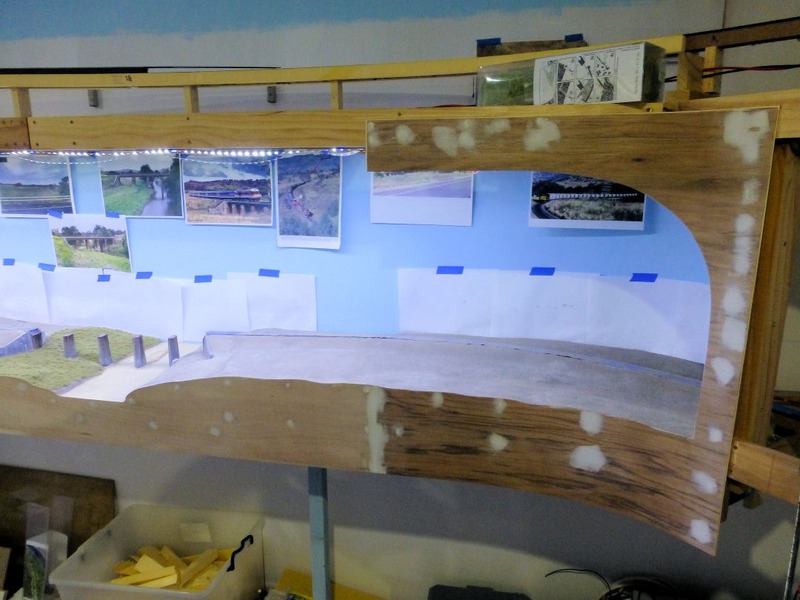 The last two pictures show the bridge span and piers temporarily in place to give an idea of how the scene will look. Final shaping of the foam will be done when the pieces are fixed down. 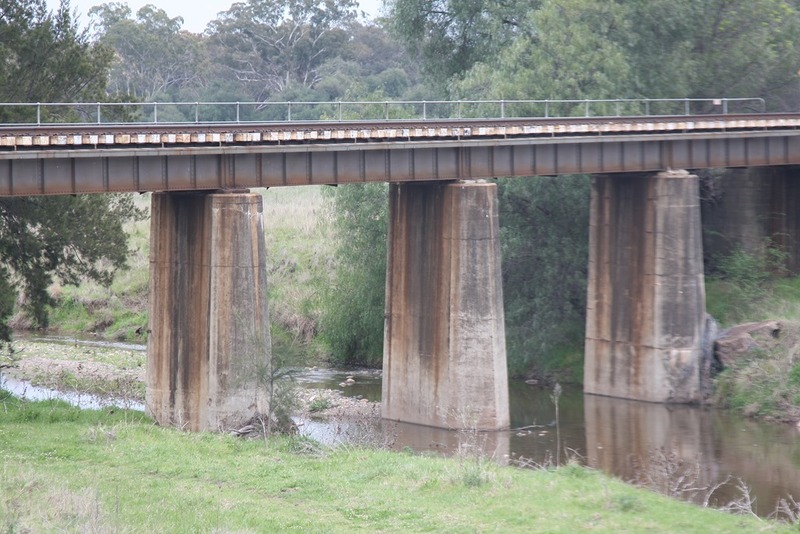 Recently I have continued work on the Chilcott’s Creek bridge scene. 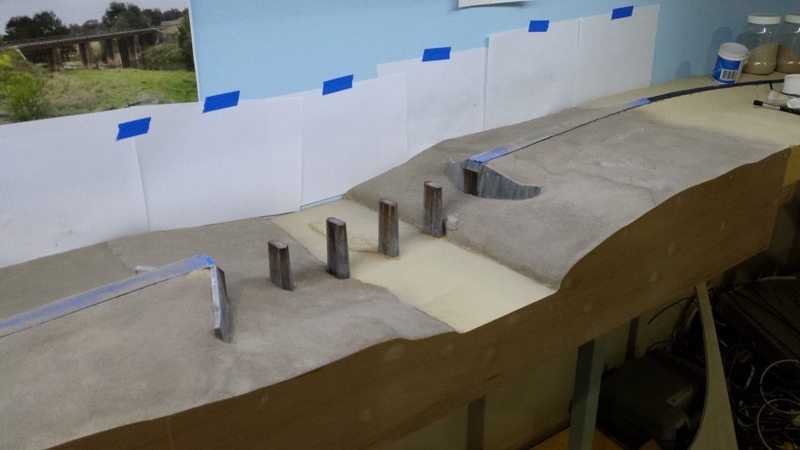 Back in December 2014, I made a post where I had started to weather the bridge piers and abutments. 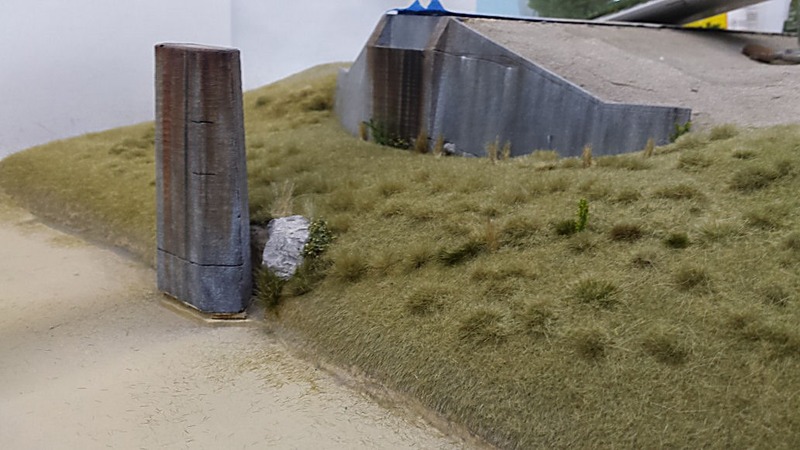 I was never really happy with how the colour on the abutments had turned out, so I decided to redo them. 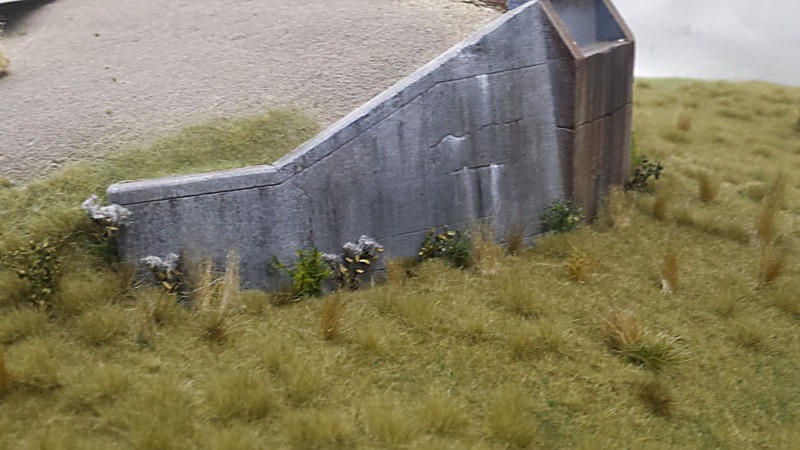 Using some new oil based paints and some new techniques, I mixed up a new lighter colour of grey and applied to the abutments. I am happy so far with the result. The paint was stippled on and has given a rougher surface appearance. I’ll redo the rust stains as well. I think I will also redo the piers. I also added the small extensions to the wingwalls. 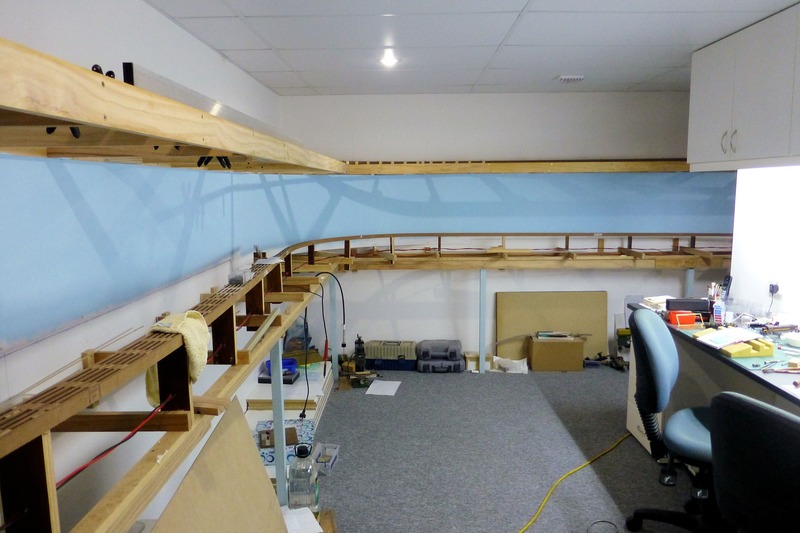 The plan was always to build the bridge on a sub-assembly and then slot it into place. As the base of the sub-module needed to be near to perfectly flat, I decided to laminate a piece of 3-ply to another piece of hardwood. 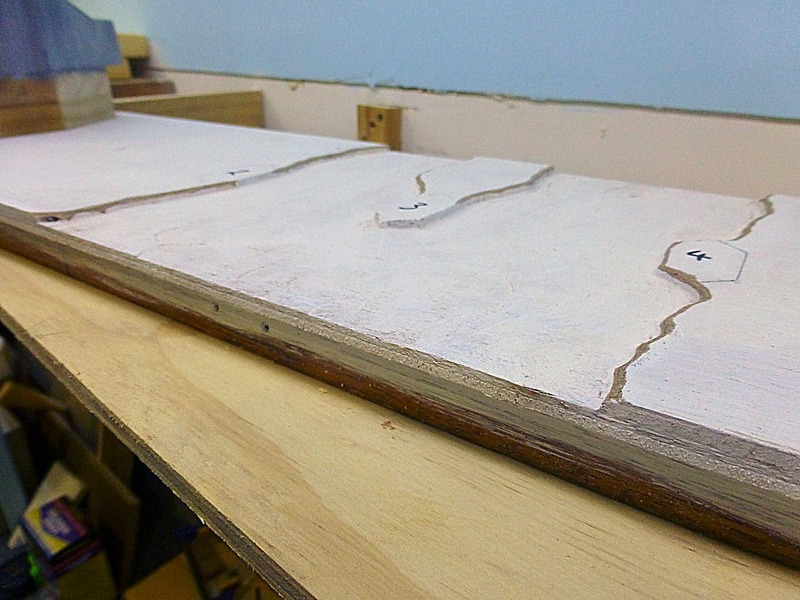 I roughly marked out the future riverbed and removed the first layer of ply using a router. My idea is to eventually try my hand at some model water. 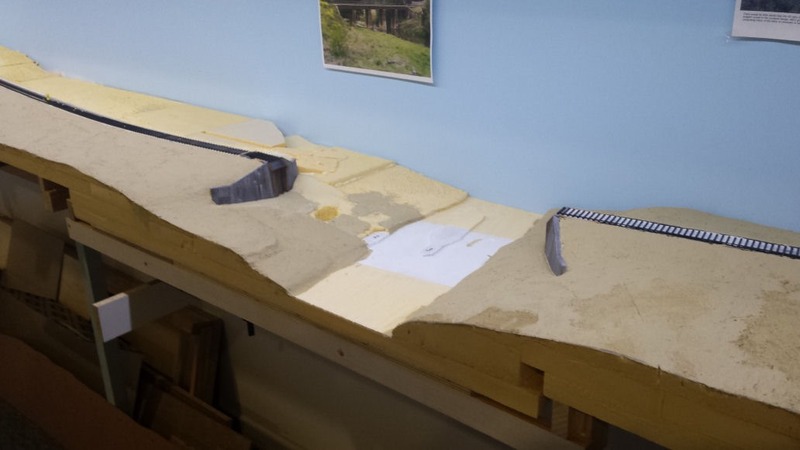 I have also started on forming the scenery around the bridge. 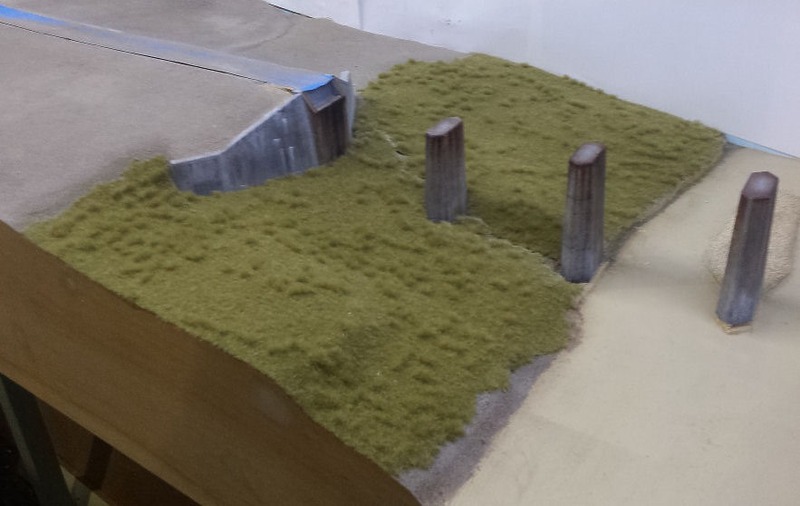 The idea is to form up the base scenery foam, add the dirts, grasses etc then assemble the bridge, fix the sub-assembly into the layout, levelling up as I go. Anyway, we’ll soon see if that plan works!! The last photo shows the bridge & piers temporarily in place. You get the idea!! 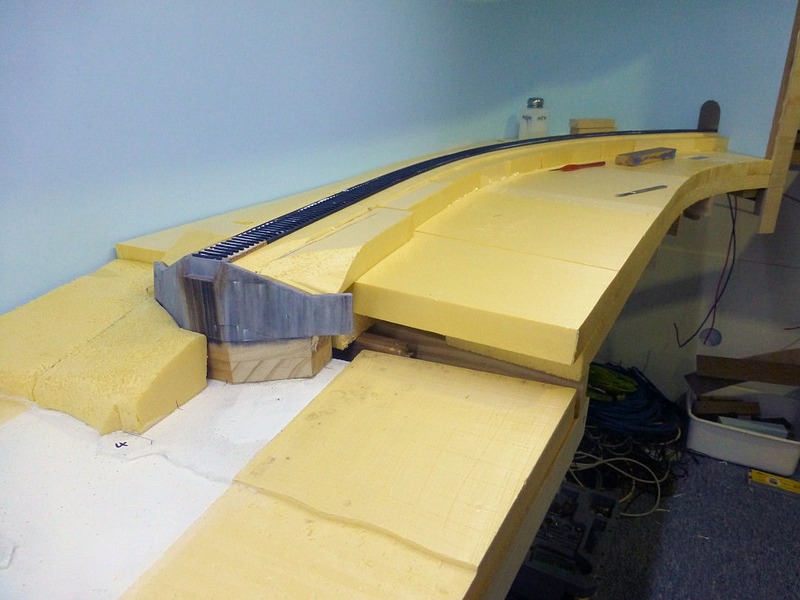 Some months ago I started laying tieplates on the bridge and have fixed one rail in place. I had been thinking of ways to do it easily, including making a jig, but Andrew suggested I just line them up against a straight edge. 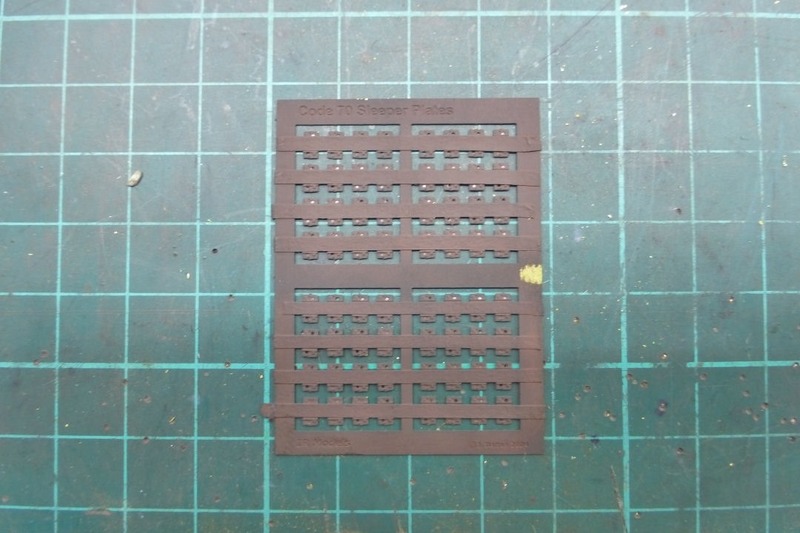 The frets of the tieplates were masked off where the base of the rail sits, painted with some Krylon flat brown paint, then dusted a ‘rusty’ colour with some powders. The underside of the tieplates were then coated with Pliobond glue. The individual tieplates were then cut out and located on the transoms, one at the end and the other about 40 transoms away. 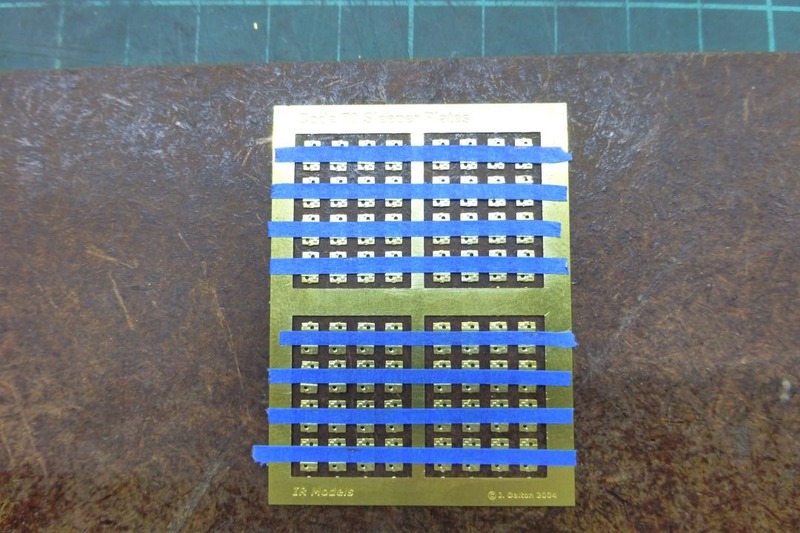 Using a soldering iron, the tieplates are bonded to the transoms. The heat activates the Pliobond. This then gave me two points to line the straight edge against. 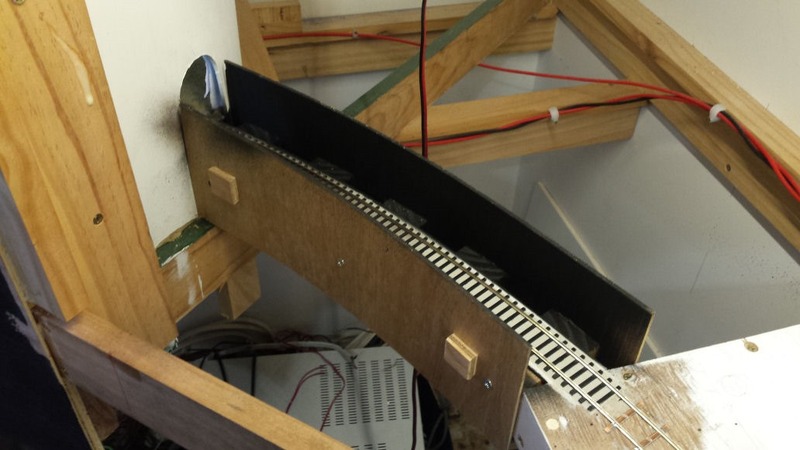 The straight edge was clamped to the bridge. More tieplates were then bonded to the transoms. The process was repeated along the bridge. 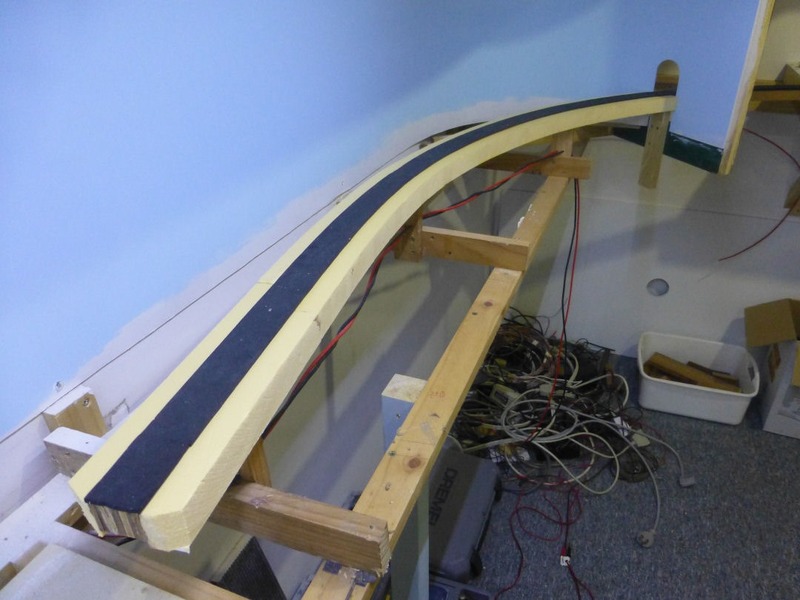 The next step was to fix one length of rail to this first run of tieplates. 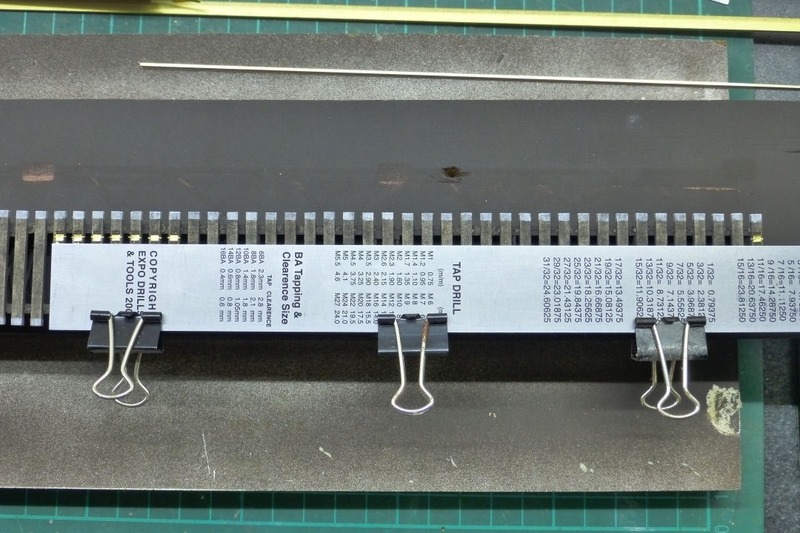 This was done by applying the Pliobond to the underside of the rail as well as the tops of the tieplates, then locating the rail in position and carefully applying heat to the top of the rail using an old clothes iron and gradually moving along the length of the bridge. The bond appears to be OK so far. 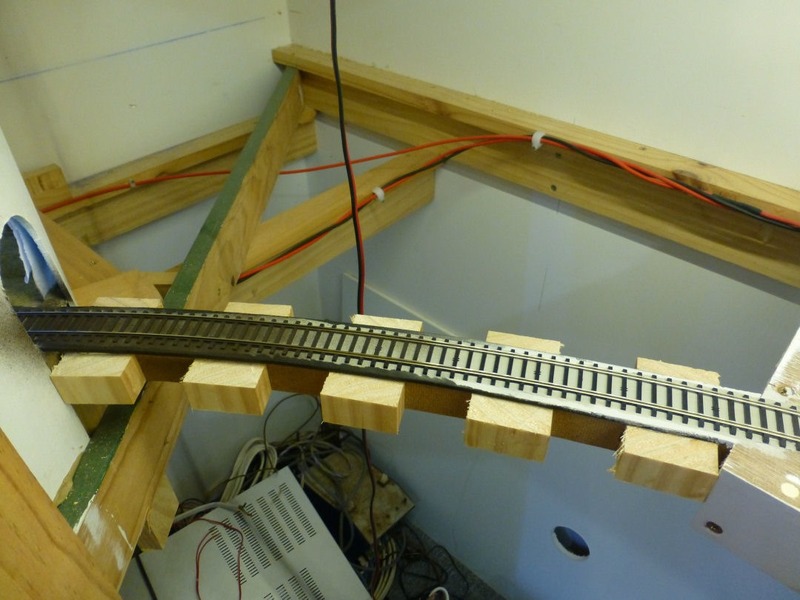 The plan is to then, using gauges, locate more tieplates underneath the second rail and repeat the above process. I have completed installation of the foam roadbed all the way from Chilcott’s Ck almost to Ardglen. I have also laid quite a bit more CV track base from Chilcott’s Ck through Kankool to just before the first peninsula. The process was the same as outlined here when I did the Temple Court section. Under where the turnouts are located at Kankool, I laid 3mm cork down instead of the foam. This was done to make it easier cutting out a hole for the future throwbar rather than trying to cut it out of the soft foam. In hindsight, I probably only needed a small section of cork directly under the toe of each turnout rather than under the whole turnout. That is what I will do on future turnouts. Taking on board an idea from Andrew, I also commenced installing strips of the high density yellow foam to the sides of the spline. 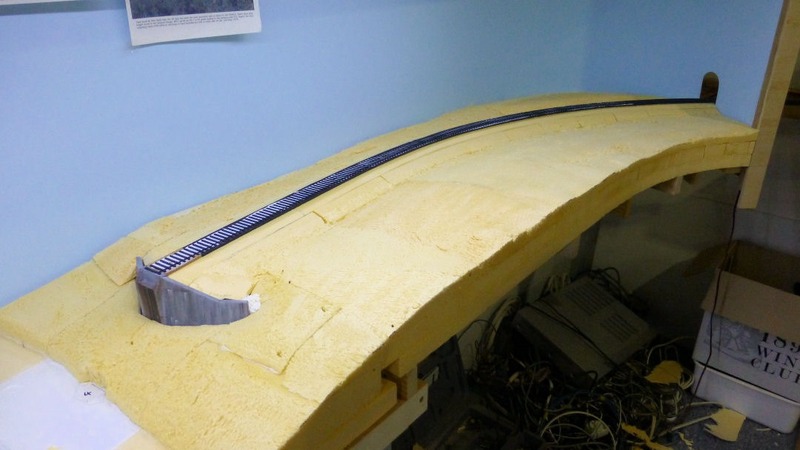 The idea here is to lay continuous foam strips along the spline to not only allow for shaping the trackbed, ballast profile and drainage, but to also make it easier to install the main scenery foam later on, rather than trying to cut many small irregularly shaped foam pieces to try and fit against the spline. Over the last week or so, I’ve done some more work on the backscene from Chilcott’s Ck to Kankool. The MDF joins were patched, then a coat of acrylic sealer undercoat was applied. I put a coat of my “sky blue” paint on the backscene this afternoon. Apologies for the lack of updates since early Dec last year. I have been busy with some scenery in the Temple Court section as well as some more benchwork and spline construction. I’ve made a start on some static grass application but have not done much since Christmas. It’s been tricky getting the look and colours right, but I think it will look OK as it progresses. Some pics below of the progress so far. I still haven’t done any more with the rocky outcrop, but you can see lots of plaster castings sitting around for inspiration. I also started installing the backscene from staging through Kankool, including the entry from staging onto the Chilcott’s Ck bridge scene. The last picture above shows the new supports installed for the upper deck above Kankool as well for backscene support. 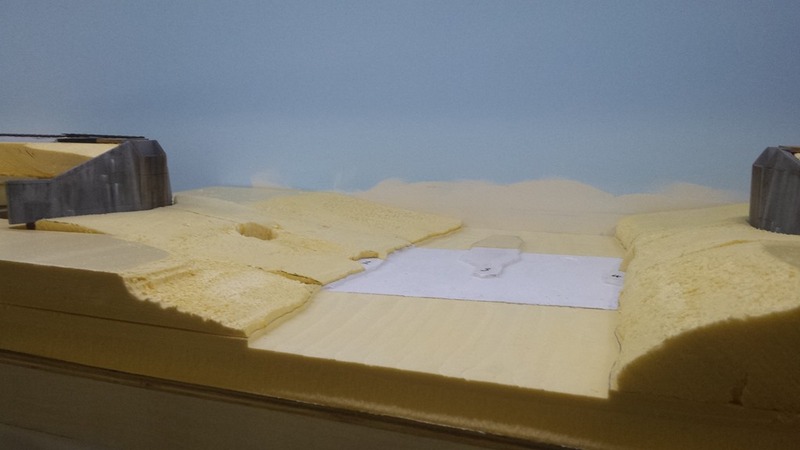 As mentioned previously, I am using 3mm MDF as the backscene and this will be painted with the sky colour. 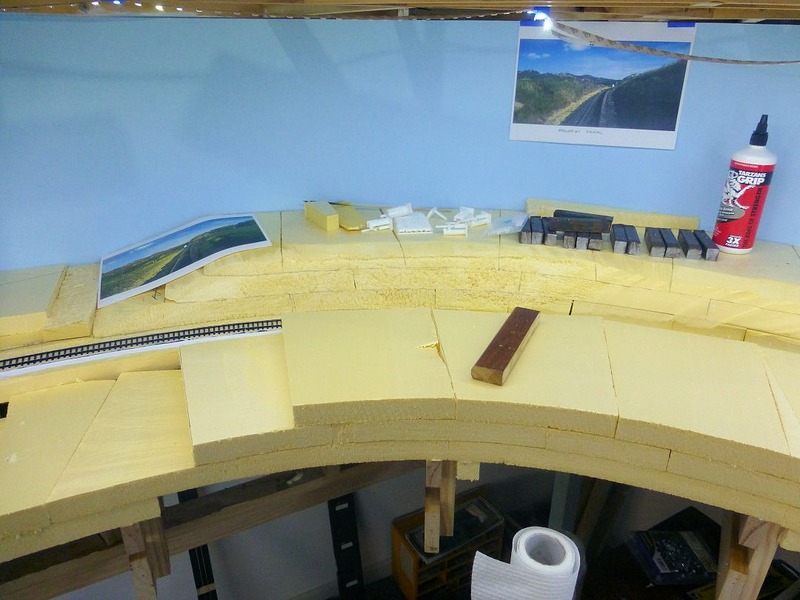 I had always planned to work on the lower deck scenery and trackwork from Chilcott’s Ck bridge to Ardglen first before the upper deck, mainly due to thinking I would have access issues on the lower deck for scenery work if I built the upper deck benchwork. 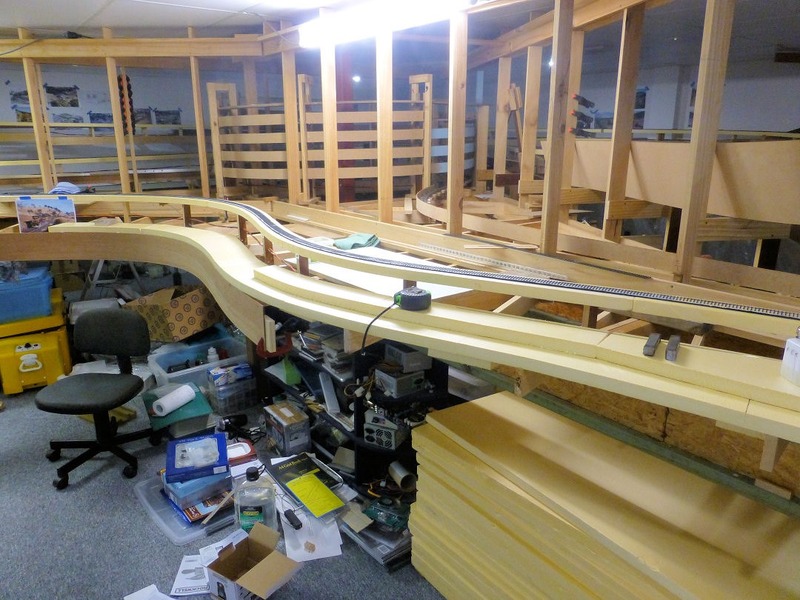 In the last few weeks I have since decided to progress with upper deck benchwork, spline and scenery from Ardglen through to Pangela as the next stage. 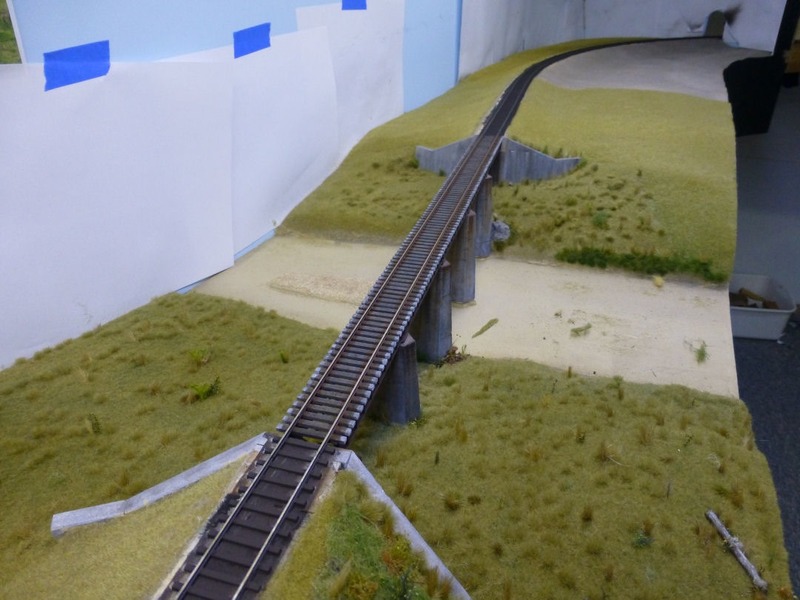 This all came about after I had started to think about getting the bridge in place and laying track from staging through Kankool. But I realised that this may not be such a good idea as once the bridge was installed, and I had scenery in place, I would be working above all this with the ever present danger of things falling on the scene below. So, the decision was made to continue with upper deck benchwork above Kankool and around to Pangela as well with spline construction from Ardglen to Pangela. 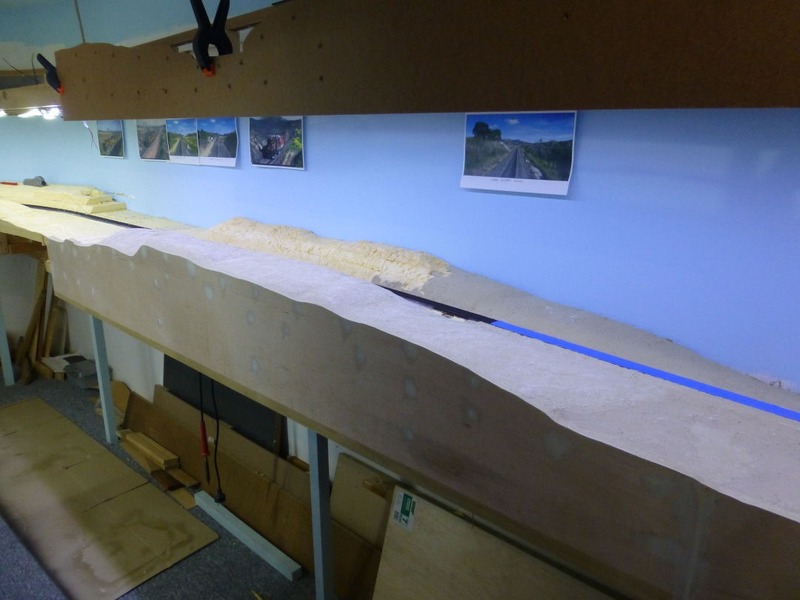 As I had already built the benchwork for Ardglen and the section above Chilcott’s Ck to Kankool some time ago (see previous post), I started to lay out the spline in this area. 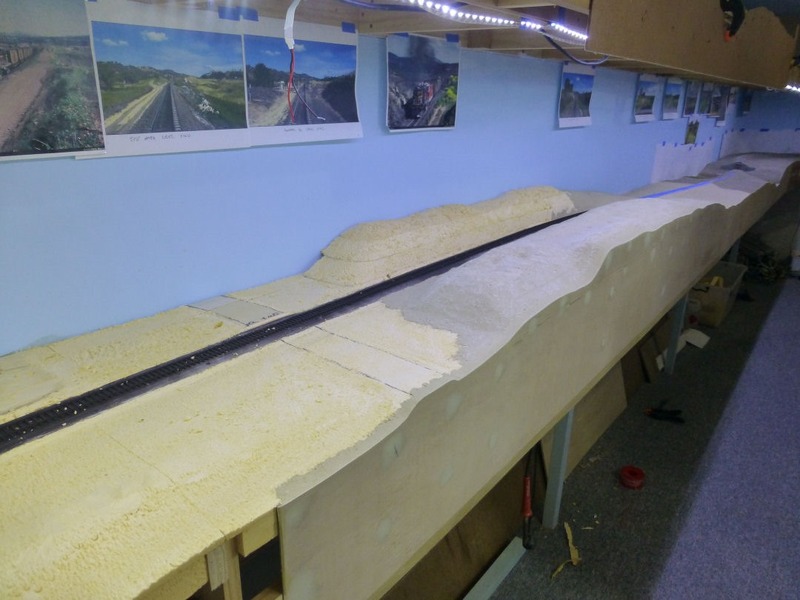 As mentioned above, the plan is to continue with upper deck benchwork all the way from Kankool through Pangela and to build the spline from Ardglen to Pangela, then start on basic scenery formation. 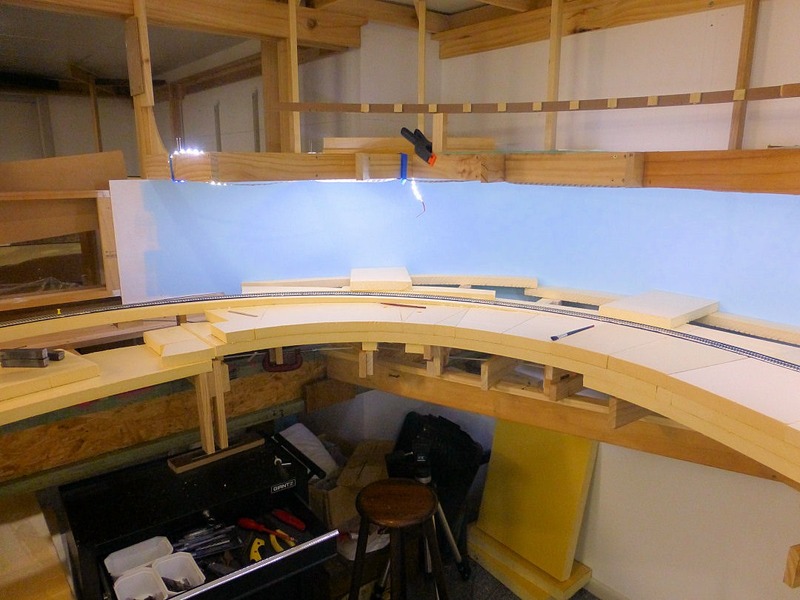 Once all the messy stuff with plaster is done on the upper deck, I’ll probably then look at getting the Chilcott’s Ck bridge installed and continuing with scenery through Kankool and beyond towards Ardglen. 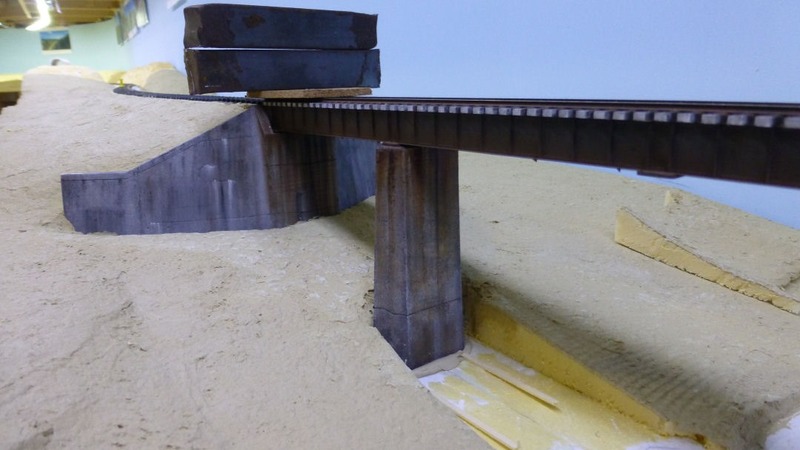 Over the last couple of days, I started weathering the Chilcott’s Ck bridge girders and piers. 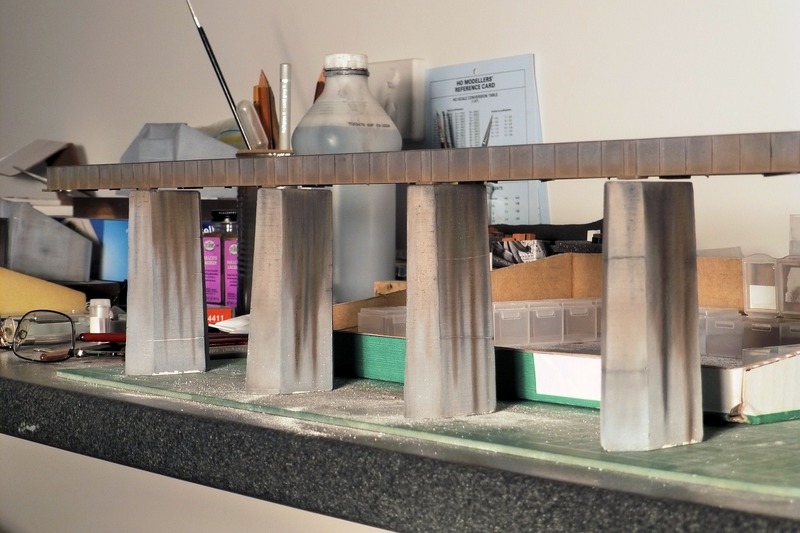 To refresh the memory, this is the bridge and the weathering effect I am trying to achieve. Even though the photo was taken in the last few years, and I am modelling 30+ years ago, I don’t think the weathering would be much less. Following on from the previous post on the subject, the completed bridge spans had been painted with Krylon camouflage brown spray paint. The plaster piers were also painted with the Krylon. 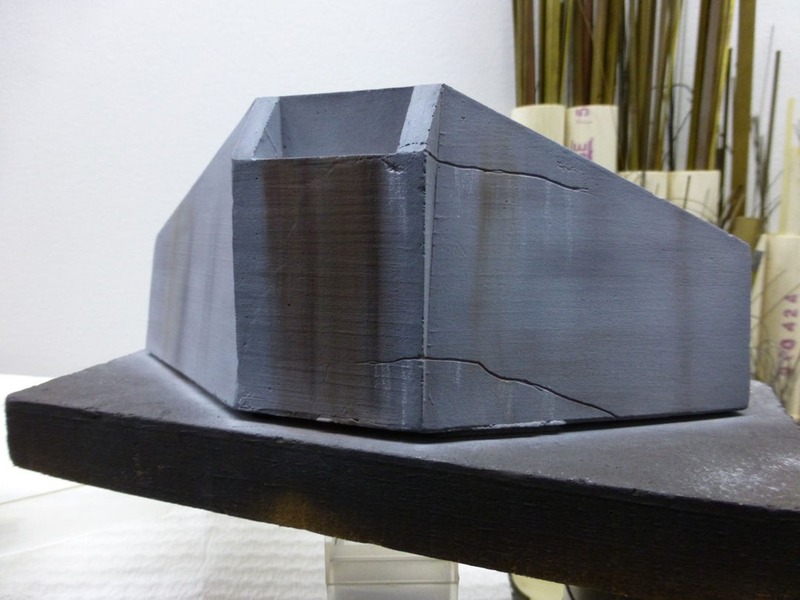 It is a dead flat matte paint that gives a good surface for the weathering powders to adhere to. 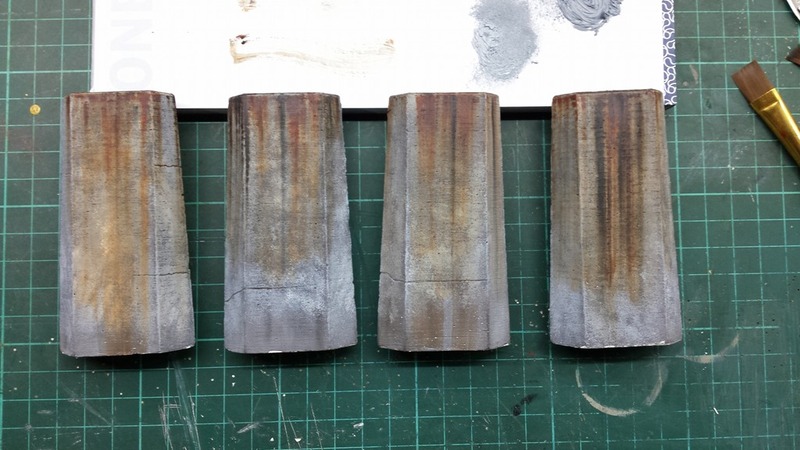 First, a bit of background on the Krylon paint and weathering powders. 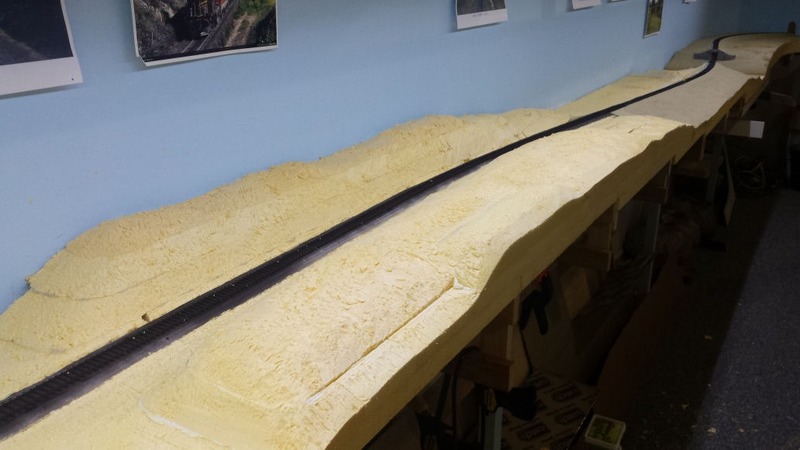 At a local model railway exhibition that was held in Sydney earlier this year, a good mate was demonstrating his latest technique for weathering rollingstock. Rather than me repeating it verbatim, have a read of this PDF as it outlines the technique in detail. For those readers in Australia, I obtained my Conte crayons from an online art supplier, The Art Shop. How Aaron sprayed the Krylon over a perfectly good model comes across as a bit drastic, but you can see the results. The Krylon is purely there to provide a “keying” surface for the crayon powders. So, both the bridge girders and piers were painted with the Krylon. The bridge girders then got a good coating of a blue/grey colour then a light hint of various shades of browns to simulate the dirt on the bottom half of the girders. The plaster piers were then attacked with a light grey colour as a base to get that weathered concrete colour. Some white was also applied to lighten the grey in certain areas. Then it was just a matter of using various shades of browns and black to get the streaking effect. Below is the result so far. Still have a bit to do, but probably not far off from being finished. I’ve also been working on the abutments using the same techniques. Below is a photo of progress so far. 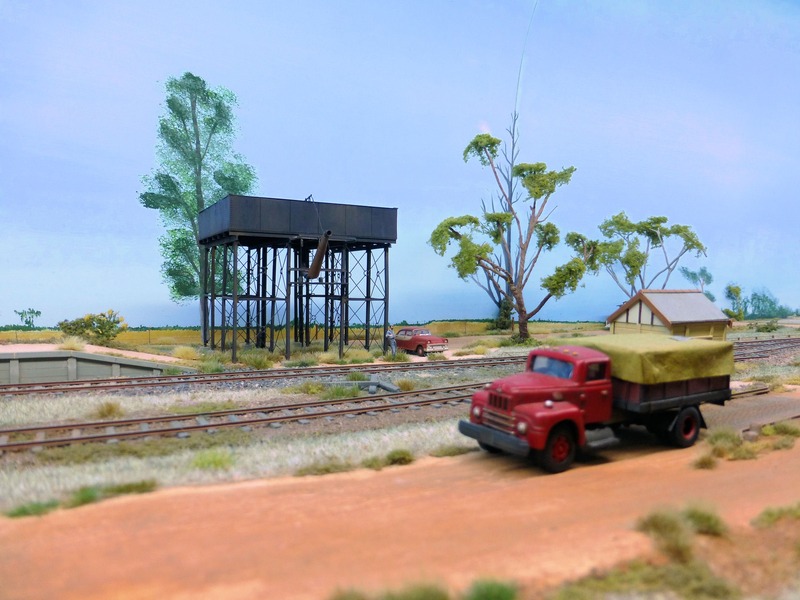 Last weekend saw me attend the 5th bi-annual New England Convention hosted by the New England Model Railway Club in Armidale NSW. Andrew and I drove up on Friday afternoon and upon arrival, met up with a lot of familiar faces along with some new ones. The event was held in the Armidale Bowling Club, utilising a large function room along with another three smaller rooms for the lectures and clinics. There were three layouts on display, but my favourite was “Bullenbung Creek” by Alan Tarrant. I had seen this layout before, but am always impressed when I see it. Below are a couple of pics I took. I also took a short video to demonstrate the DCC sound from a typical branchline goods train. Click here to watch it on YouTube. I also had the opportunity to play with the NCE DCC system which was in use on Bullenbung Creek. I had always planned to use the EasyDCC system, but just recently discovered a limitation in how consists are handled. With EasyDCC, consists cannot be made or broken up from the handheld throttle, they must be done at the command station. Some months ago, a mate showed me a photo of a triple 48 class working at Pangela (see below). Photo courtesy of Phil Collins. In the photo, the single 48 class (the bank engine), has detached from the train and waits in the loop. The remaining 48’s will continue with their train. 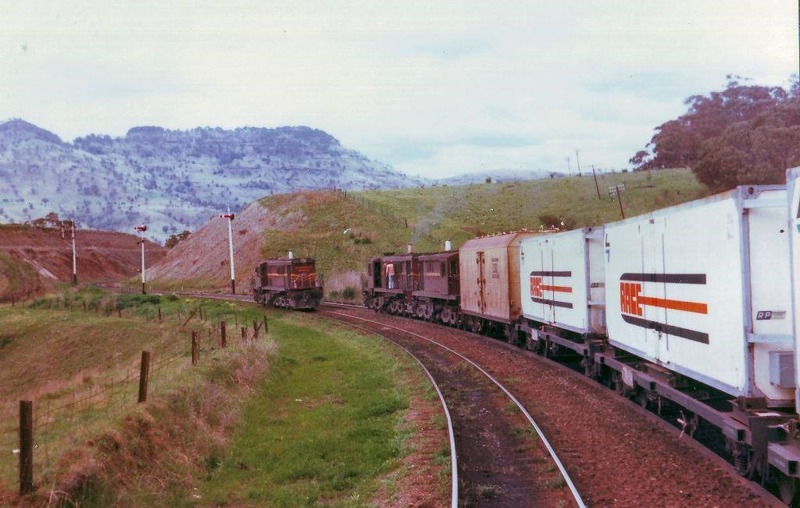 The single 48 will run light engine back to Willow Tree or Werris Creek. I thought this operation would be cool to replicate on the layout. The idea is to have the three 48’s marshalled on the train in staging and when they reach Pangela, the lead engine will detach from the train and run light engine back to staging and wait for the rest of the train to also return to staging, where it will be reattached. 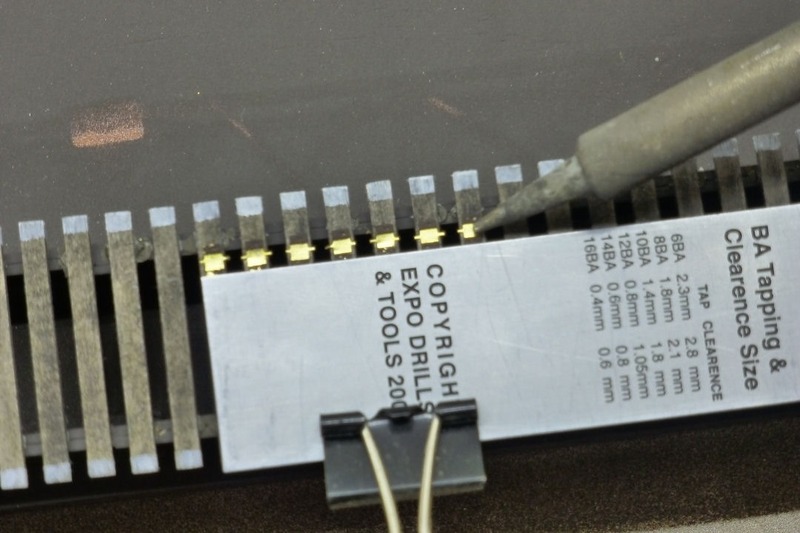 In replicating this operation, the detaching of the single 48 ideally should be done with the handheld throttle, but with EasyDCC, the operator would have to go to the Command station, break the consist, and then continue. With the NCE system, this can all be done from the throttle, which will be much easier. Admittedly, I only need to do this with this one train, but I think it will be better. So, the upshot is, I have decided to change DCC systems. I won’t be rushing out to buy the NCE just yet, but at least I can now plan what I need to buy in the way of hardware. I have also been quite busy with work continuing on the scenery in Temple Court. 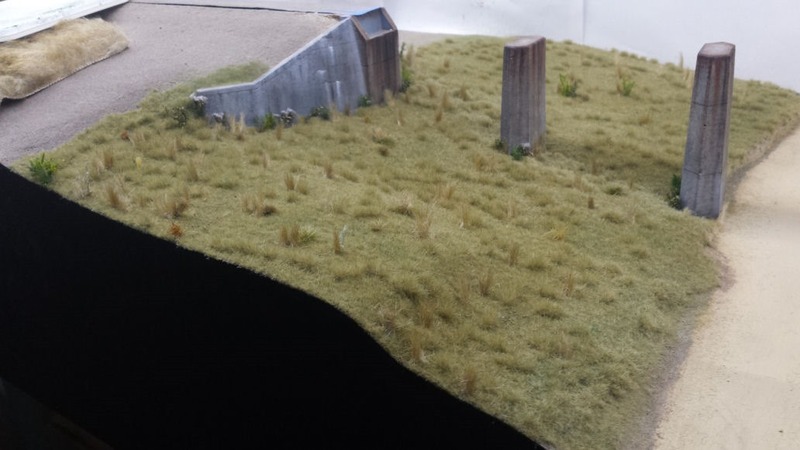 The base scenery with the Sculpt-it has been 95% completed, and is nearly ready to start applying dirts and static grasses. 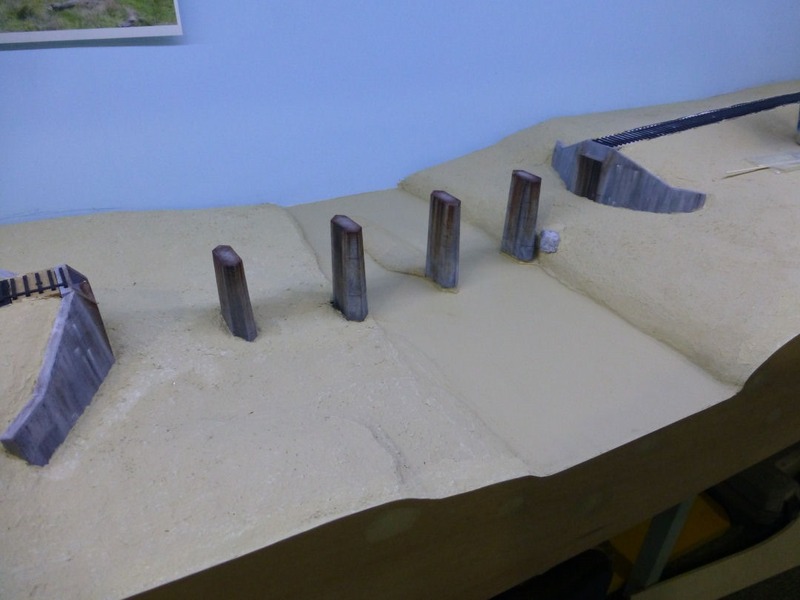 I have also been playing around with making plaster rock castings to try and replicate the large rocky outcrop as shown below. Photo by Mick Morahan. More on the rock castings in a future post. Compare the shot below with where it was up to on August 29.